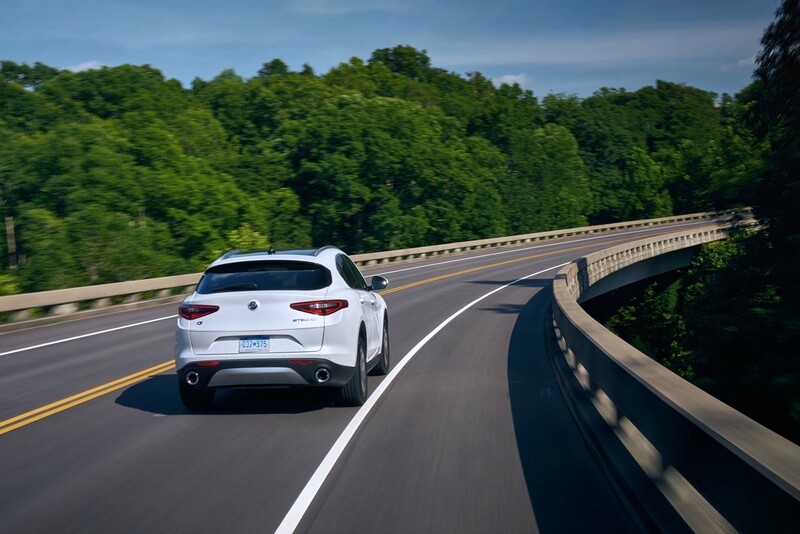 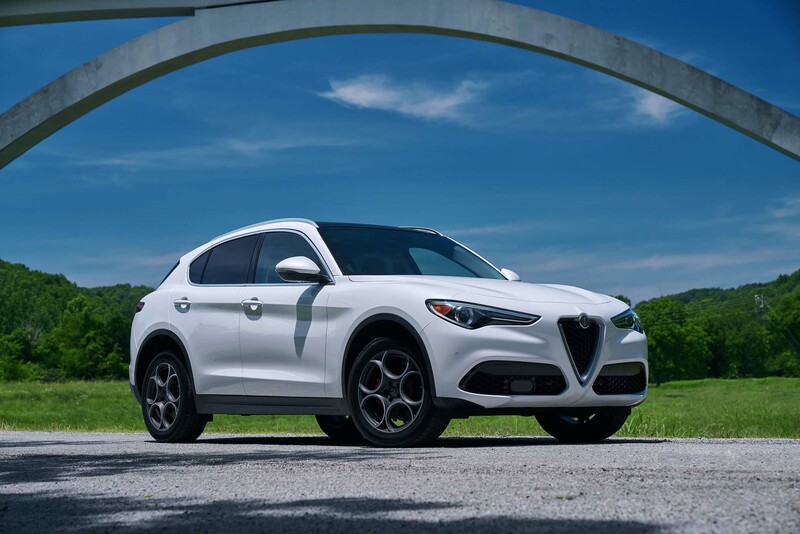 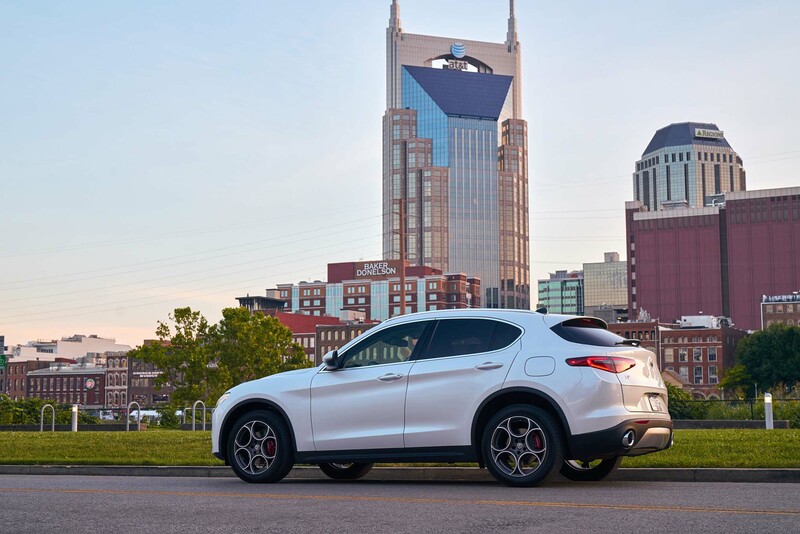 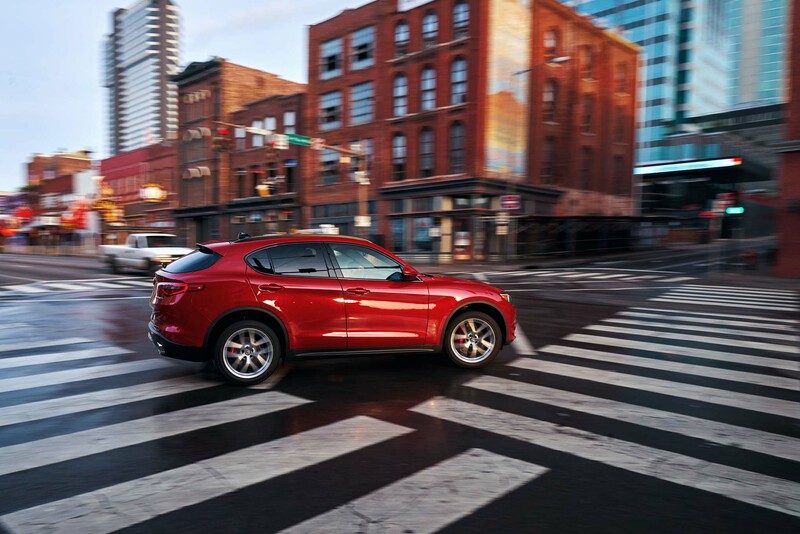 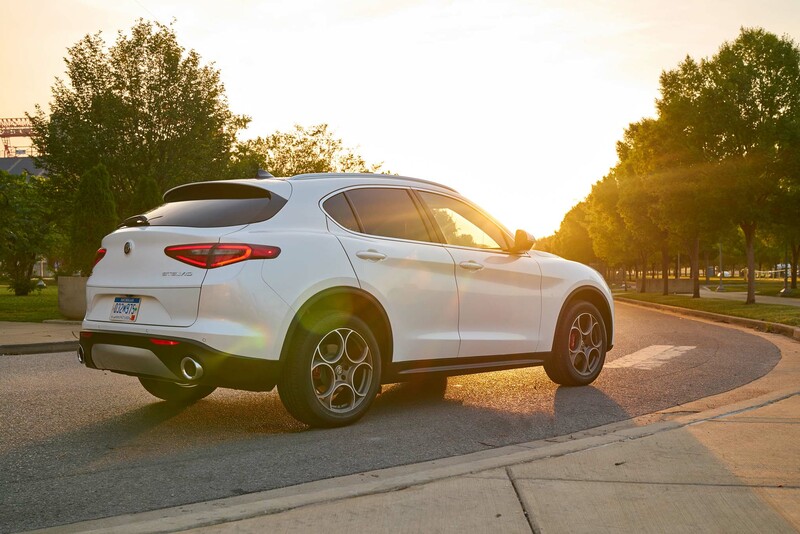 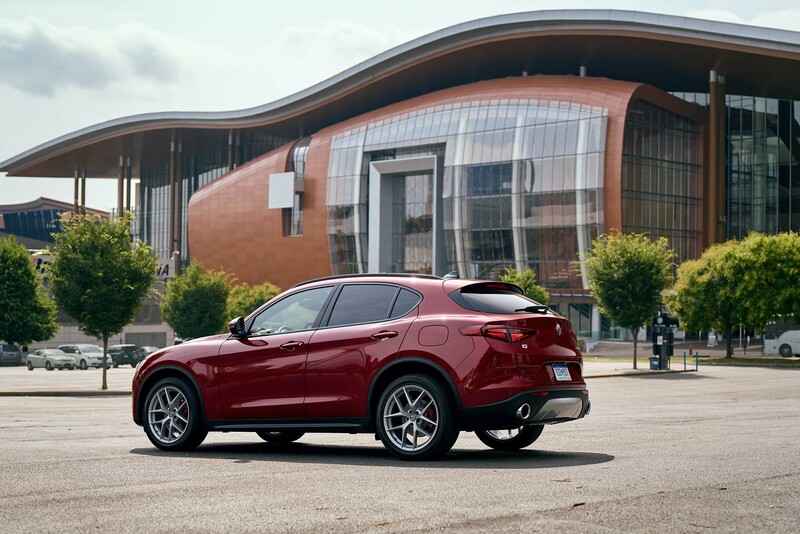 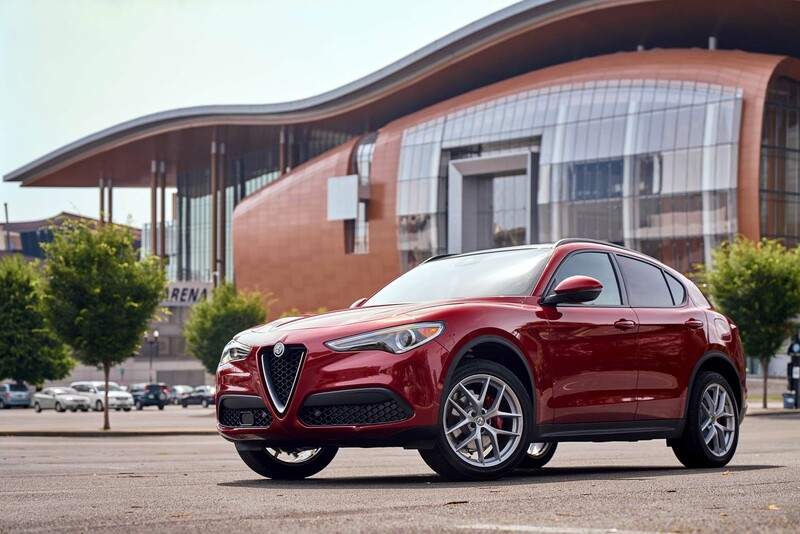 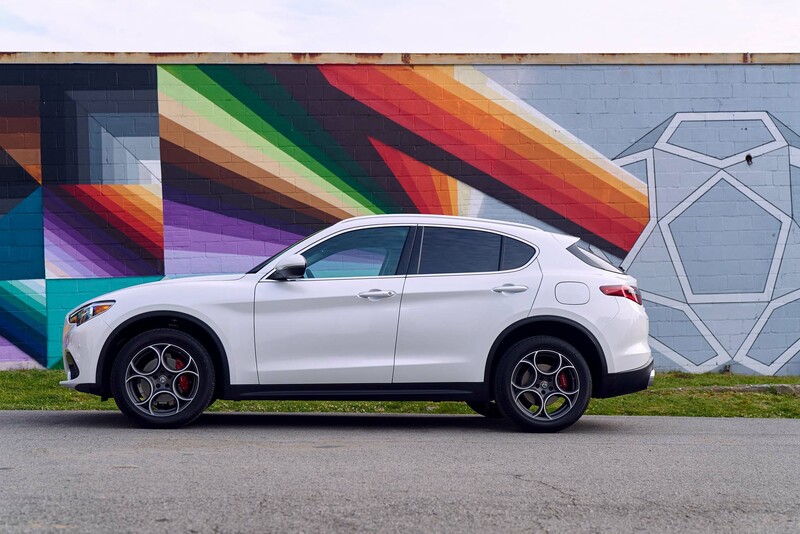 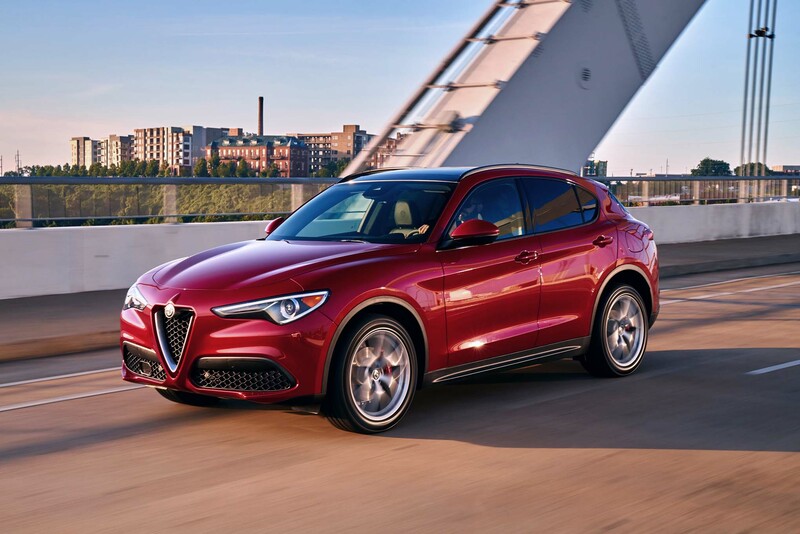 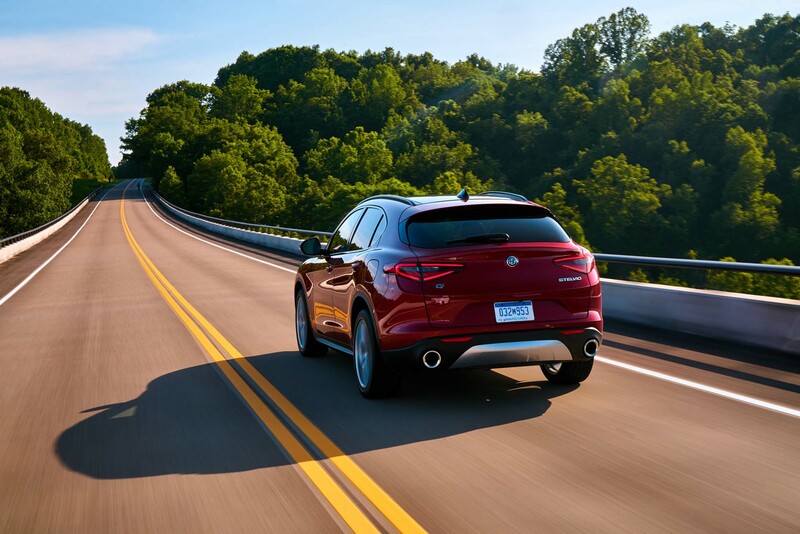 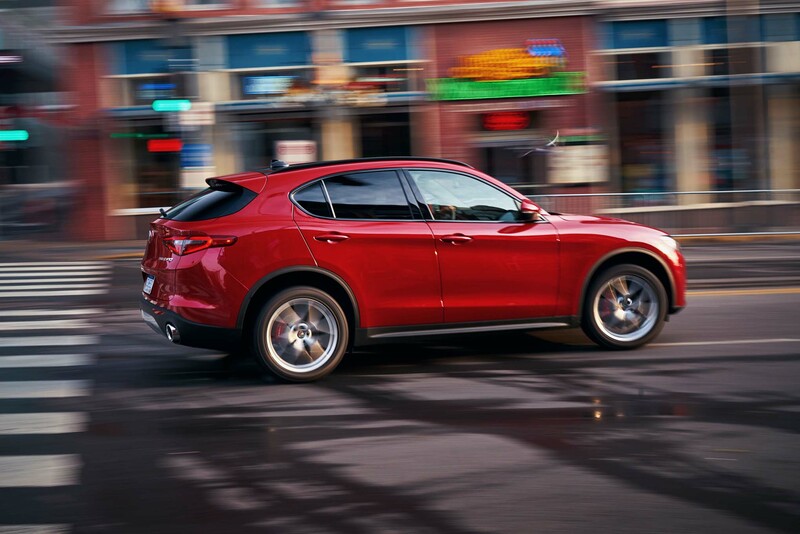 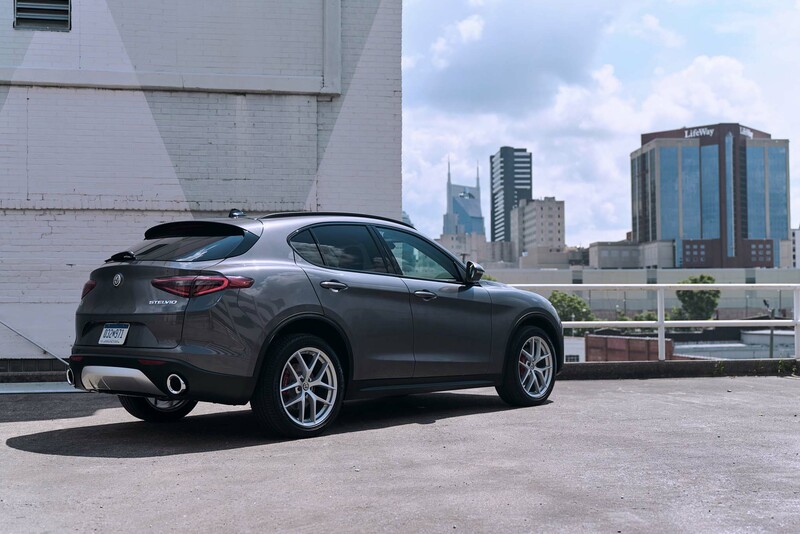 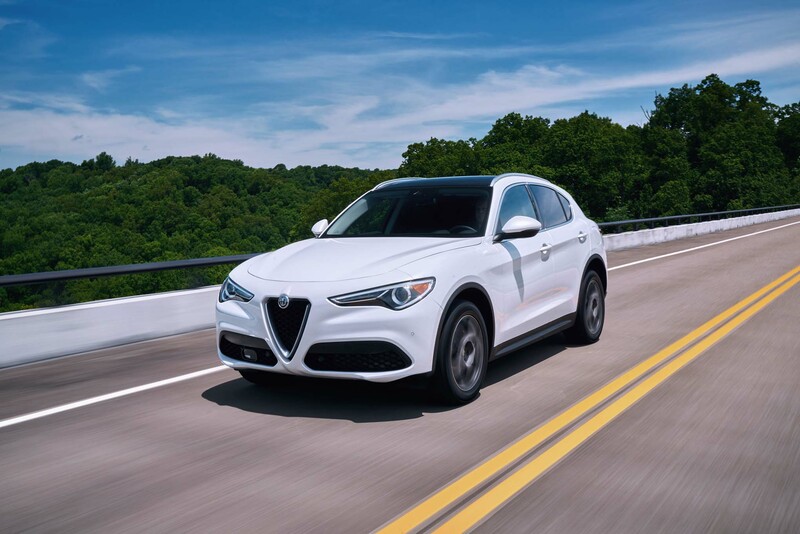 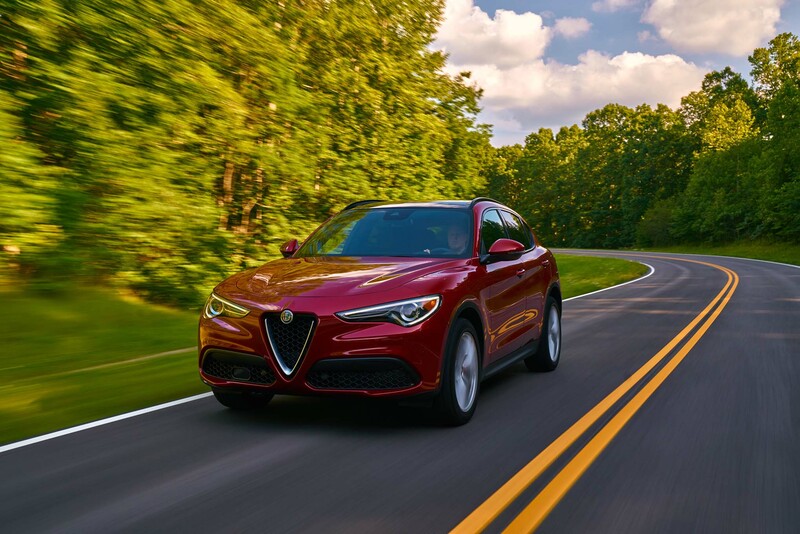 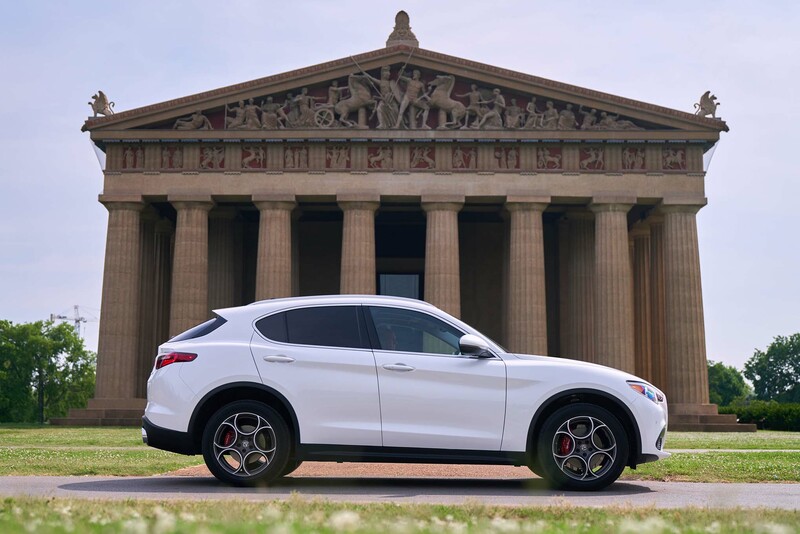 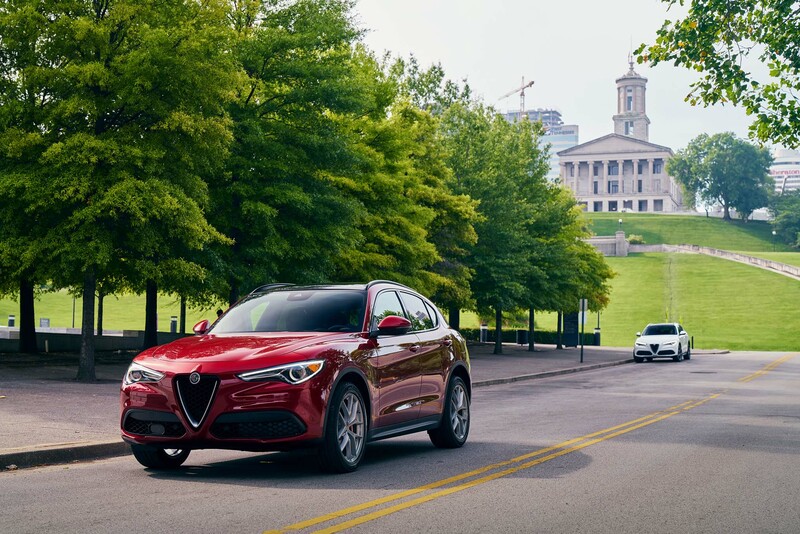 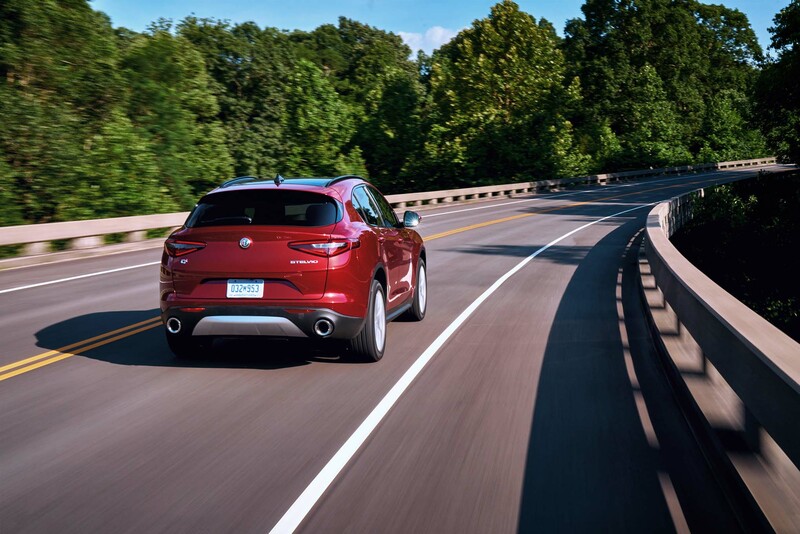 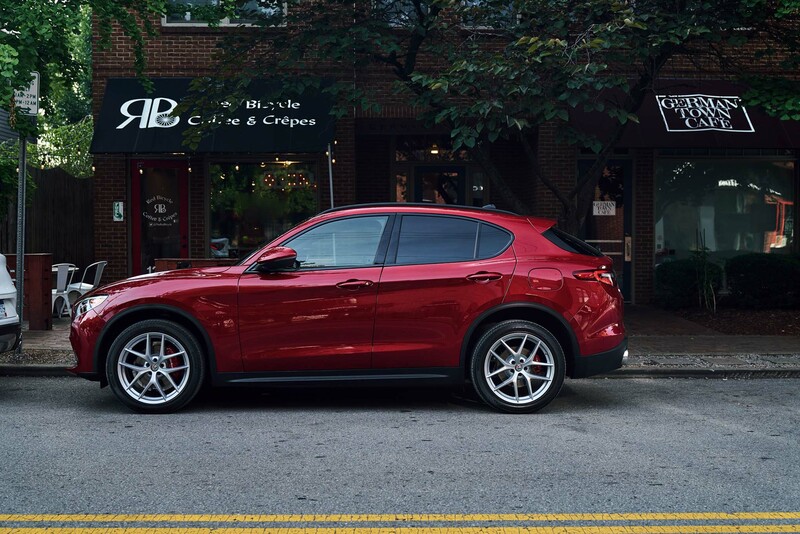 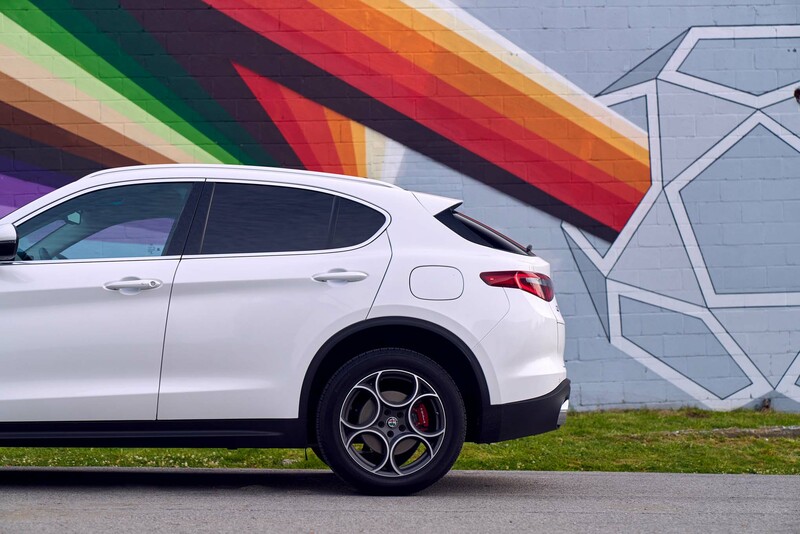 NASHVILLE, Tennessee — The 2018 Alfa Romeo Stelvio plans to join a tough street gang — there are some accomplished members like the Audi Q5, Mercedes-Benz GLC, BMW X3, and a newcomer with a year’s jump on the Stelvio, the Jaguar F-Pace. 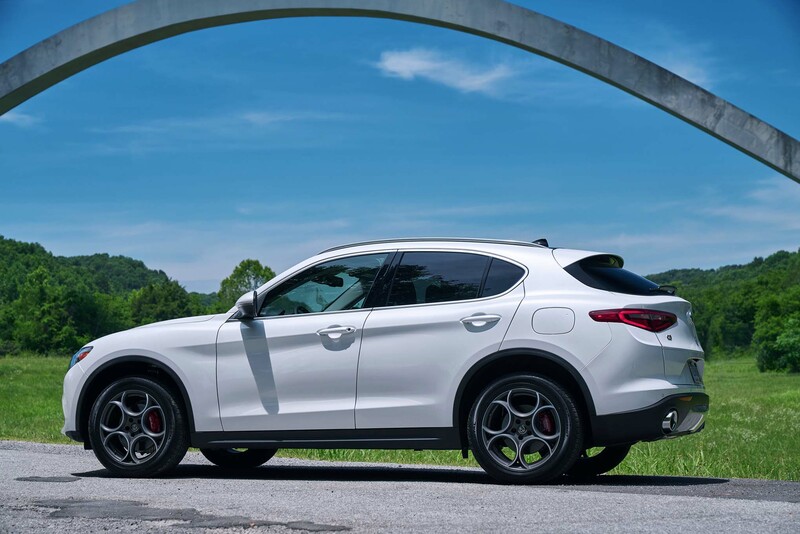 Those are the midsized premium sport-utility vehicles that Pieter Hogeveen, director of Alfa Romeo North America, lists as the central competition for the Stelvio. 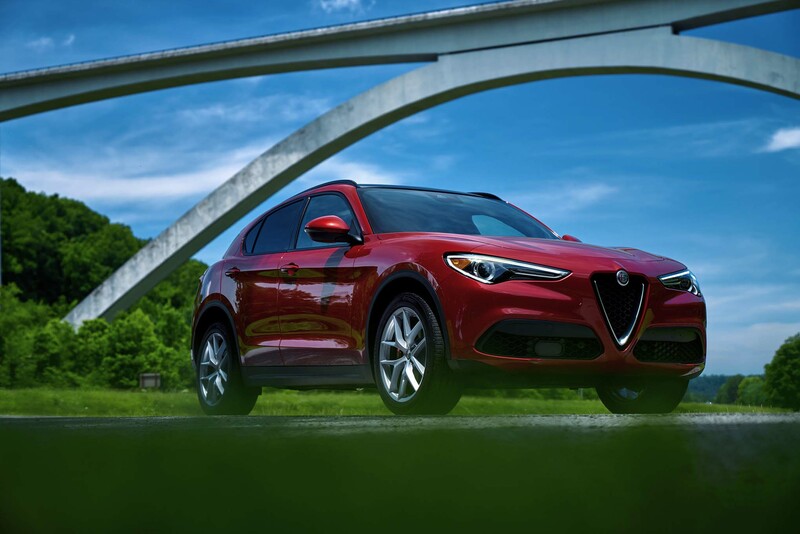 Which is named, incidentally, for a mountain pass in the Italian Alps. 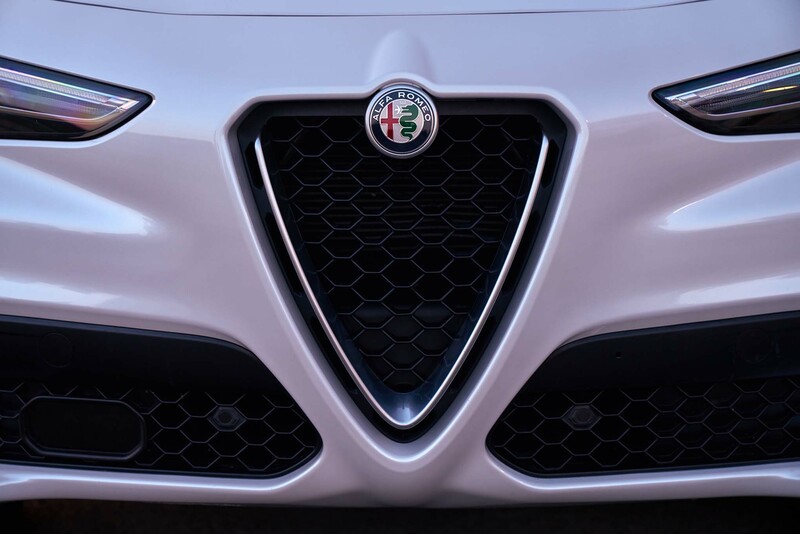 And while we’re at it, that trademark triangular Alfa grille is a “Scudetto.” And the twin panels beneath it and to either side are the “Trilobo.” Are we the only ones who didn’t already know that? 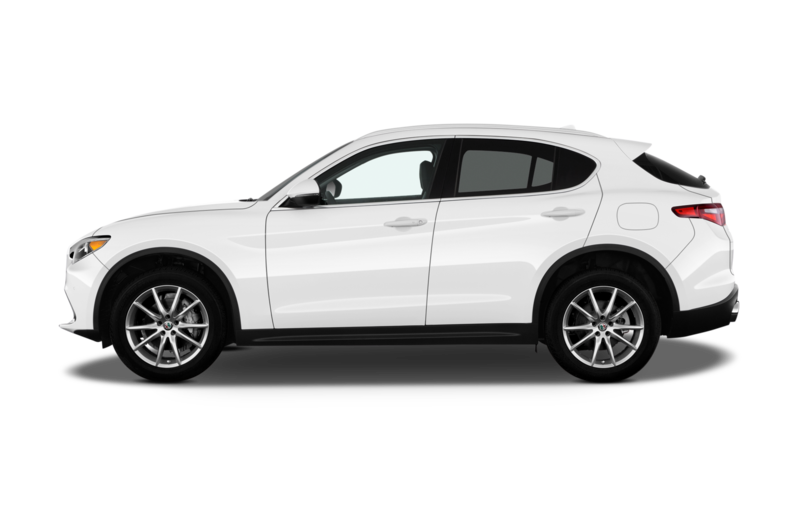 Besides the four competitor vehicles Hogeveen listed above, we could add plenty more from Volvo, Acura, Lexus, Infiniti, Cadillac and Lincoln. 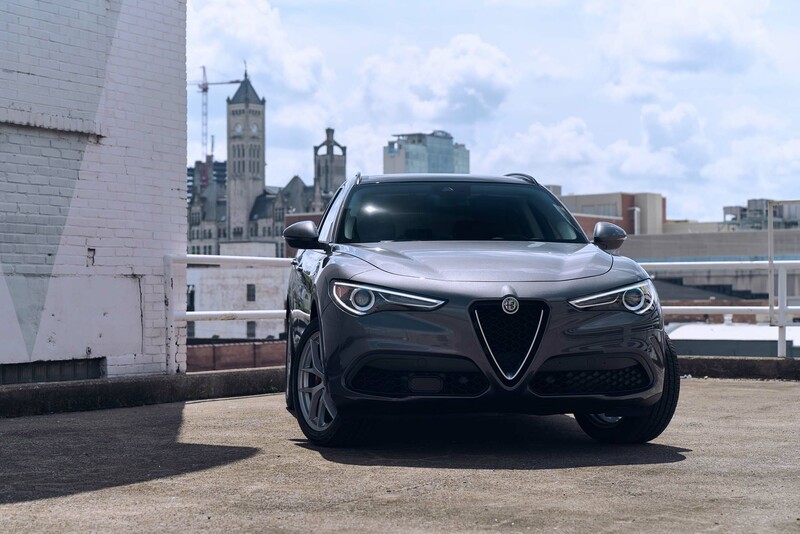 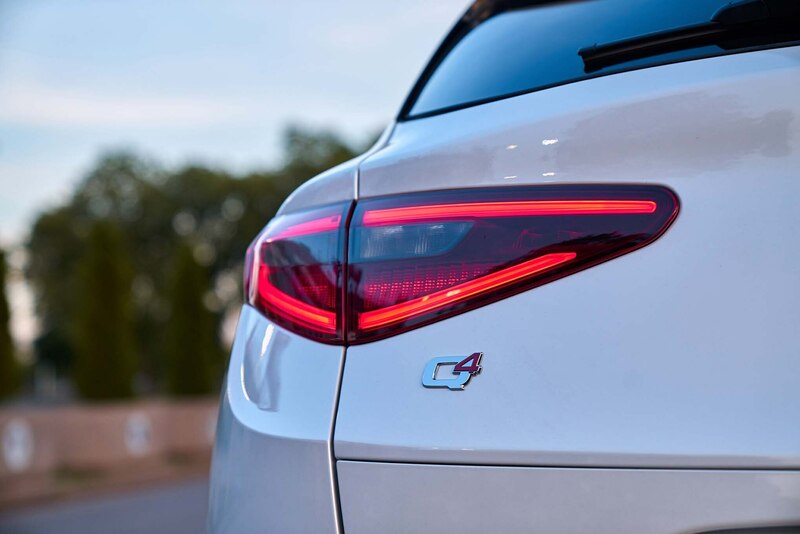 We can understand the European appeal of a sports sedan like the Giulia, but we’re less sure if that will be a plus or minus to premium SUV buyers, who seem more likely to prize dependability and a history of strong resale value over Italian savoir faire. 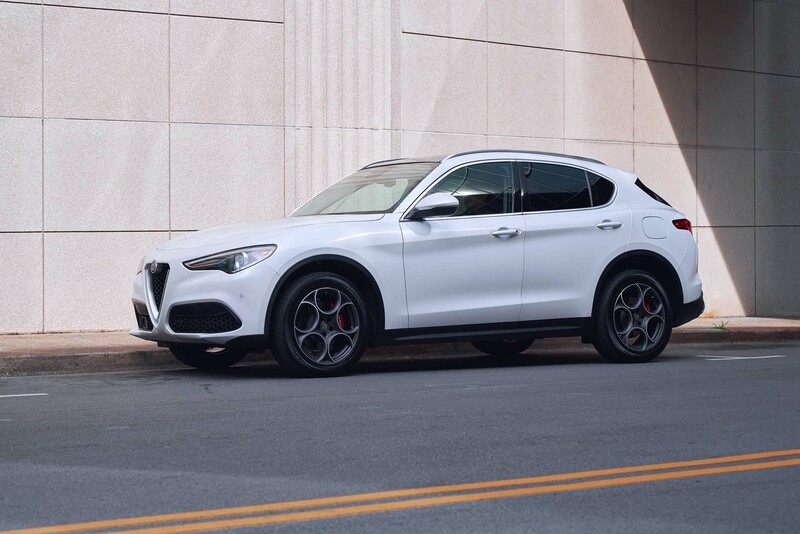 This is not to say our first impression of the Stelvio isn’t good, because it is — quite good, in fact. 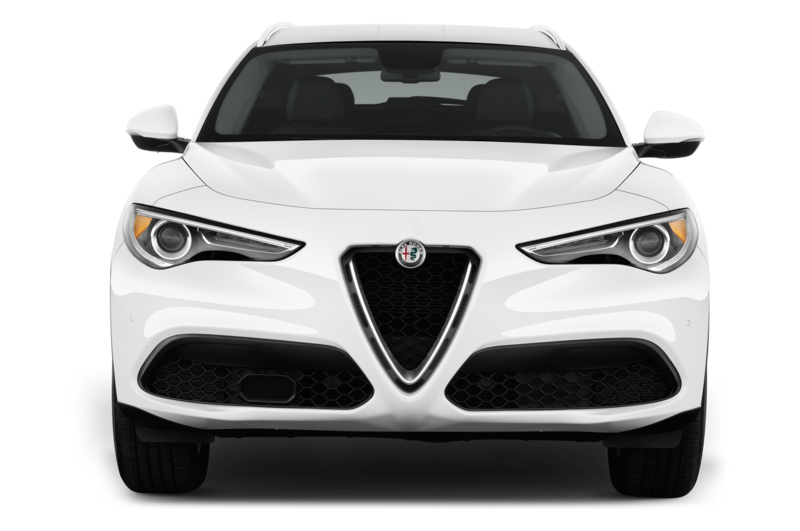 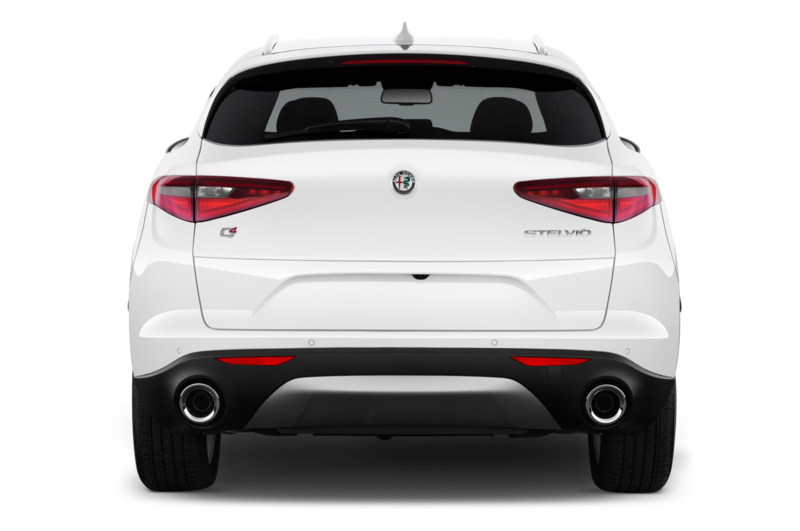 Based on the Giulia platform, the Stelvio is a handsome, good-handling, quiet, comfortable sport-ute’, from the Trilobo to the taillights. 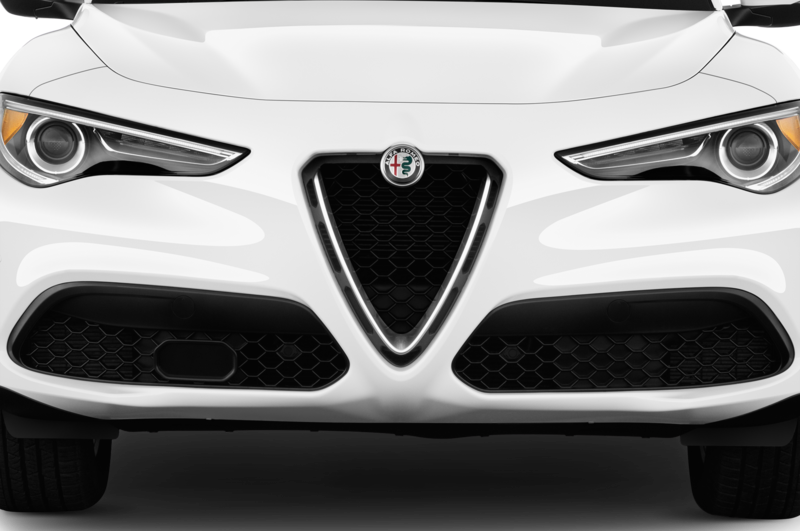 Of course, if your favorite Giulia is the invigorating 505-horsepower Quadrifoglio, you might be disappointed that the Stelvio Quadrifoglio won’t arrive until the first quarter of 2018. 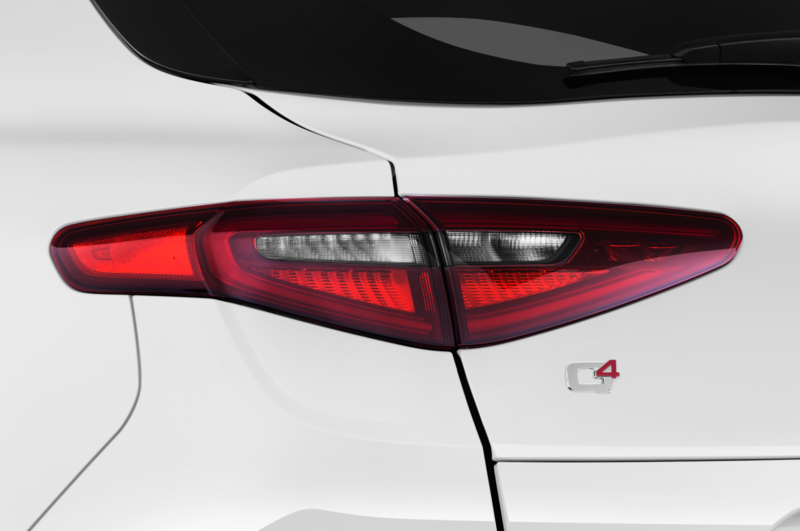 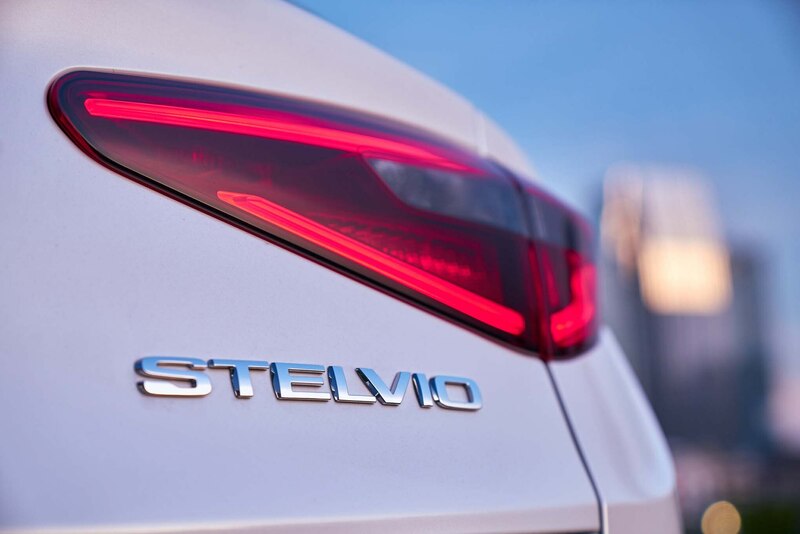 But there are 750 of the four-cylinder Stelvios at the port in Baltimore right now, fresh from the factory in Cassino, Italy; expect them to begin arriving soon at a Dealer Near You. 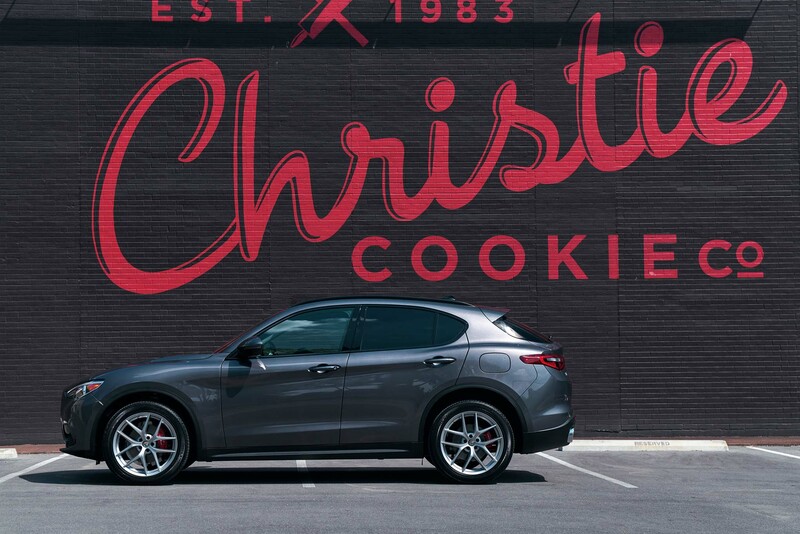 Assuming, that is, you have a Dealer Near You. 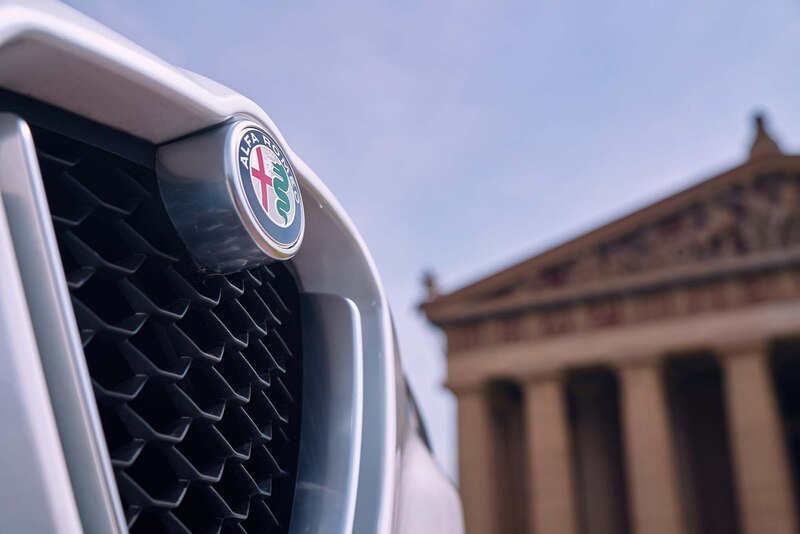 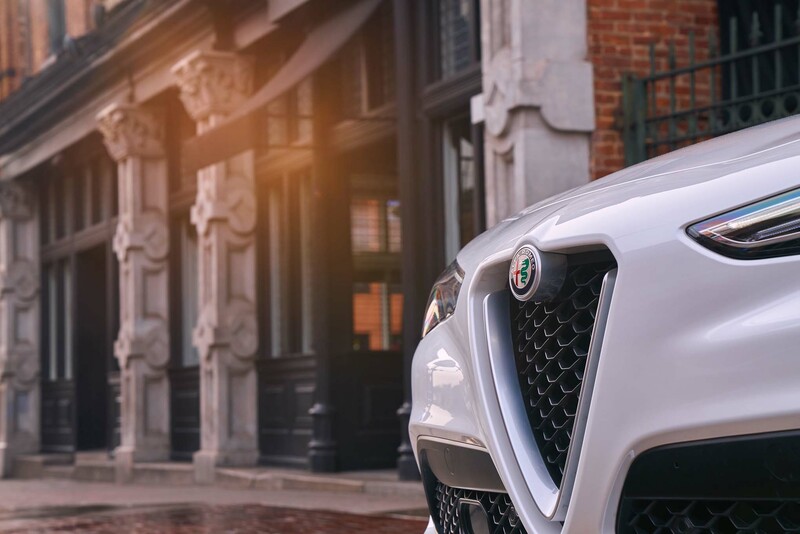 Alfa is still in the process of growing its dealer network; there are 168 in the U.S. right now, and the company expects the number to grow to 216 by year’s end. 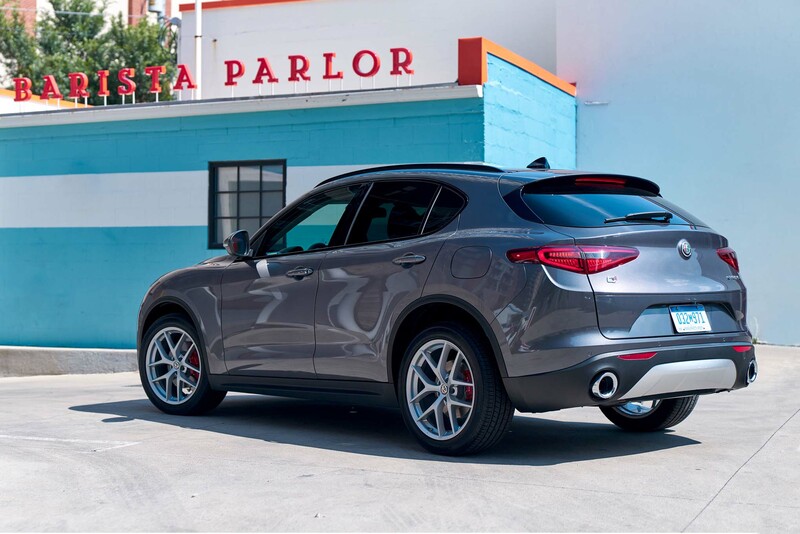 Many are paired with Maserati stores. 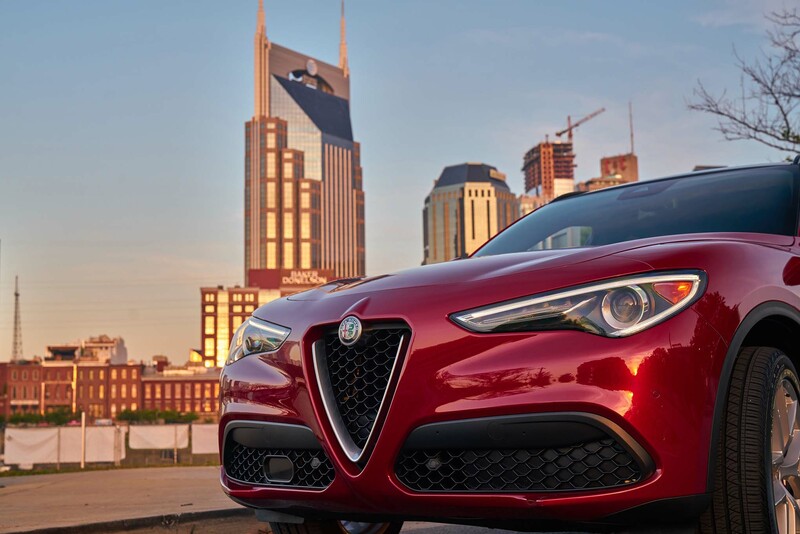 Sales in the U.S. have been modest; 98 vehicles in the fourth quarter of 2016, with an expectation of 3,000 by the end of the second quarter this year. 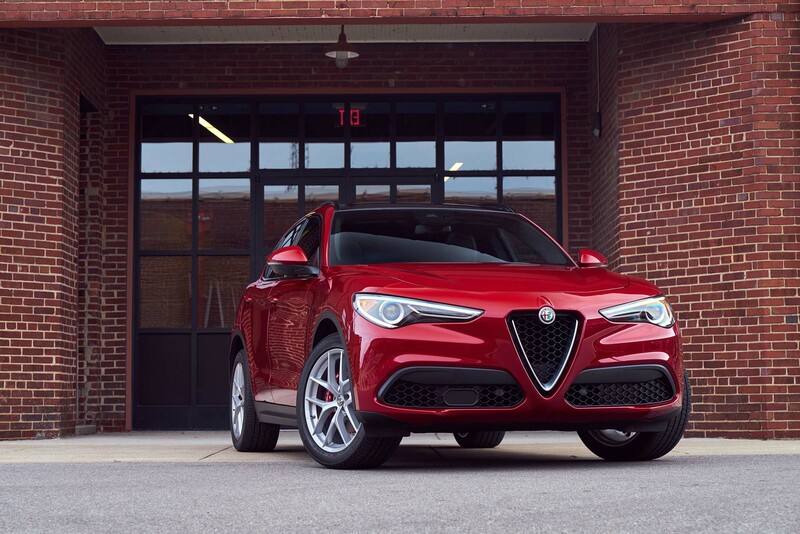 Alfa suggests that Stelvio and Giulia sales will be roughly equal. 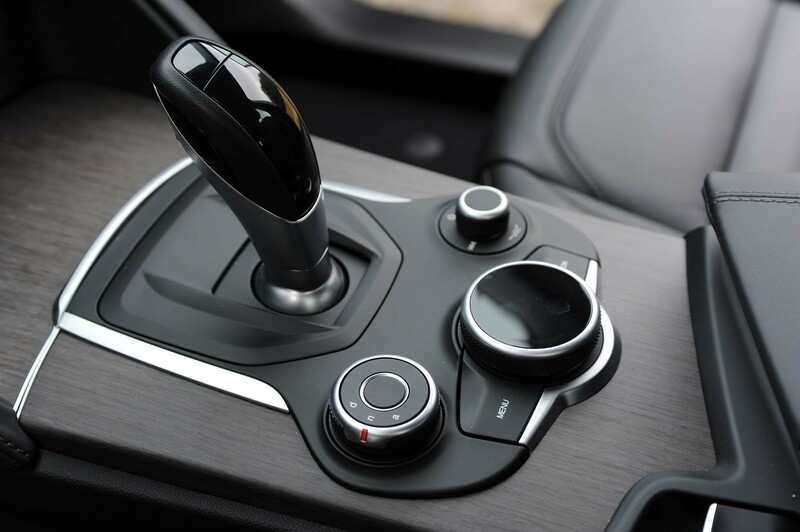 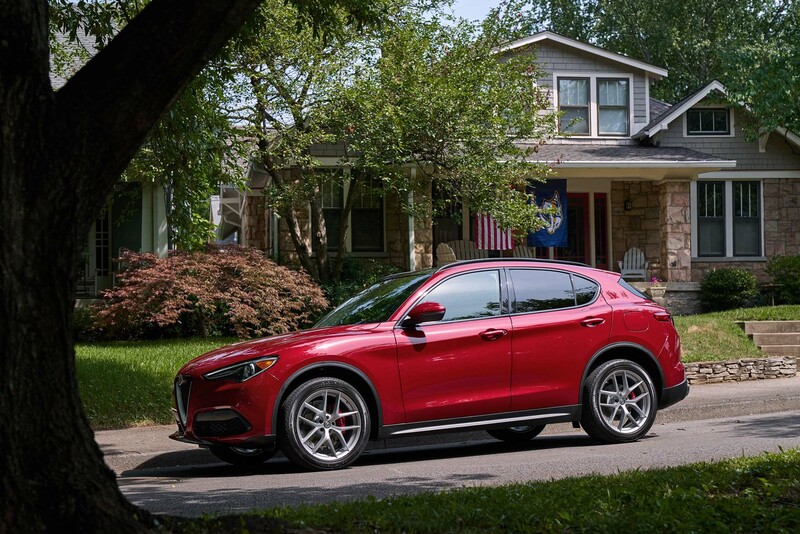 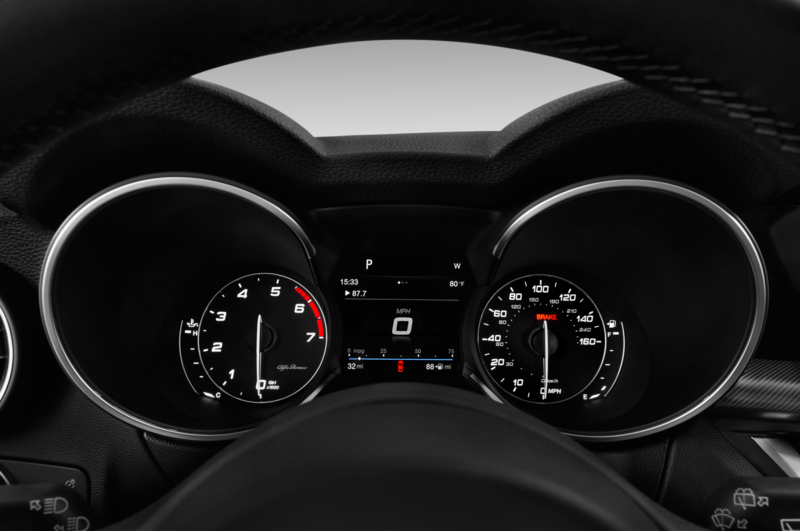 The base model Stelvio lists for $42,990, and is by no means a stripper: All Stelvios are all-wheel drive, with a bias toward the back: An active transfer case can send 100 percent of the power to the rear wheels, and 60 percent to the front when needed. 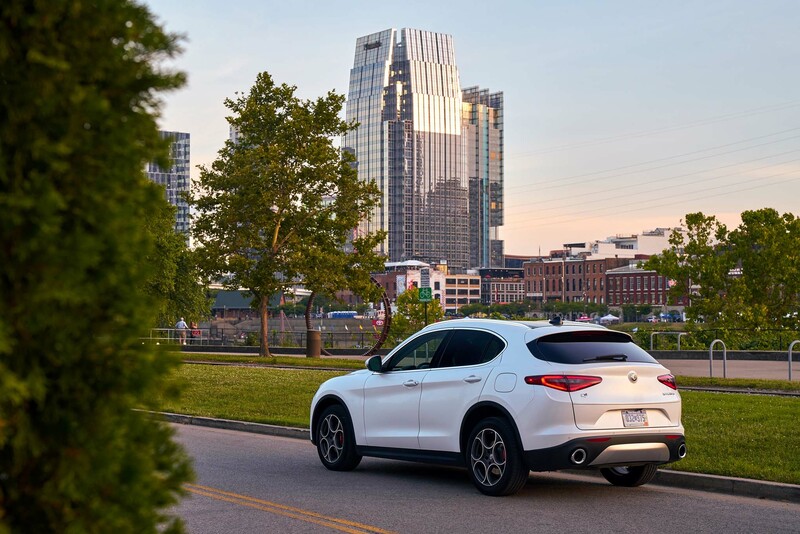 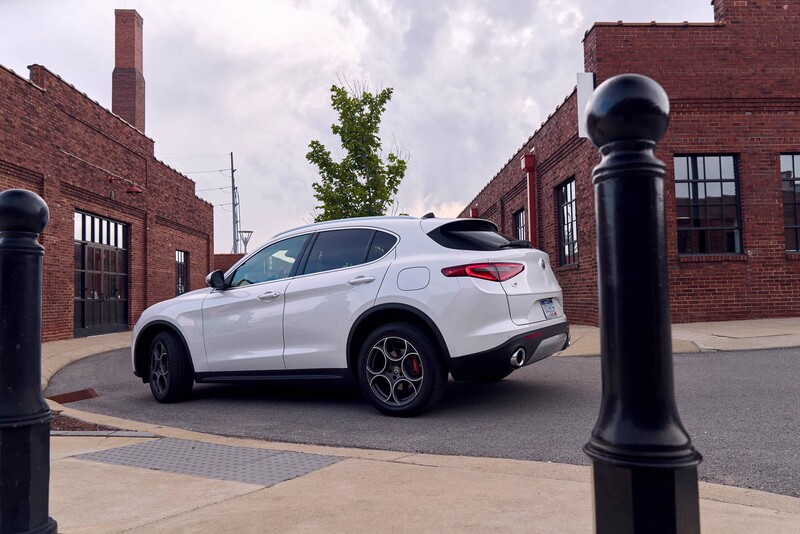 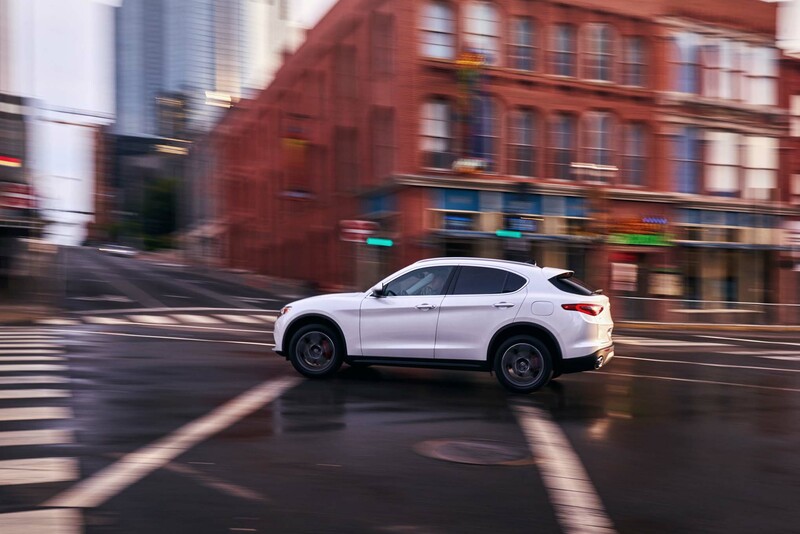 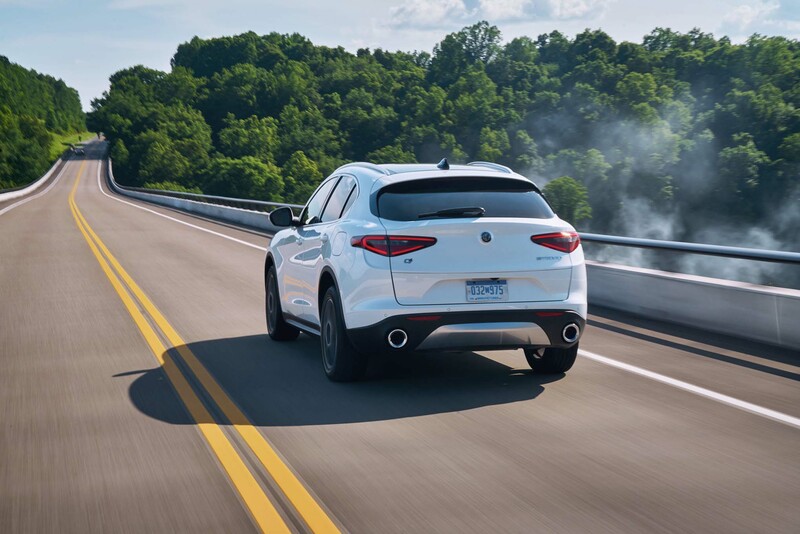 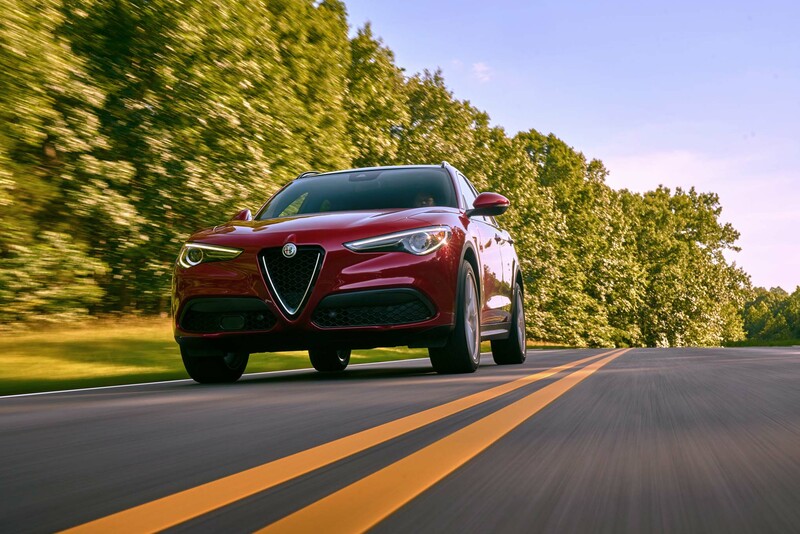 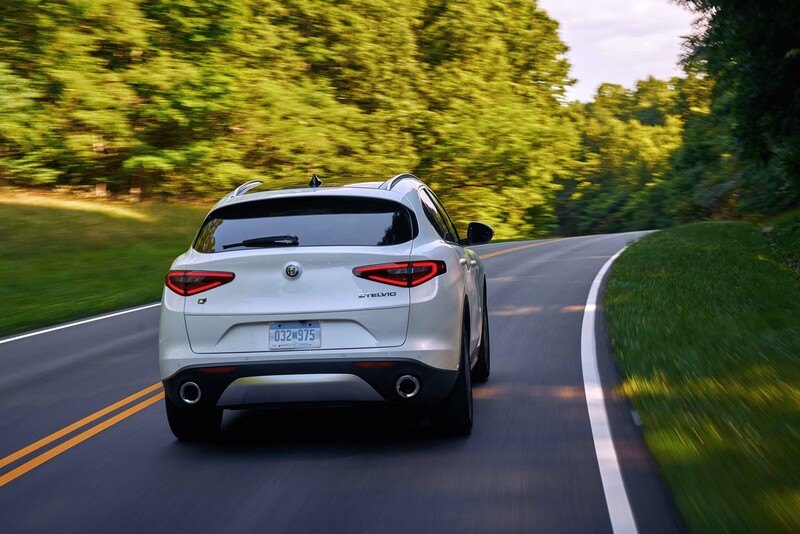 The Stelvio feels like a rear-drive vehicle —vcand that’s a compliment — but in our day of test-driving them on the roads around Nashville, Tennessee, we encountered a lot of wet conditions, and the very welcome AWD worked seamlessly. 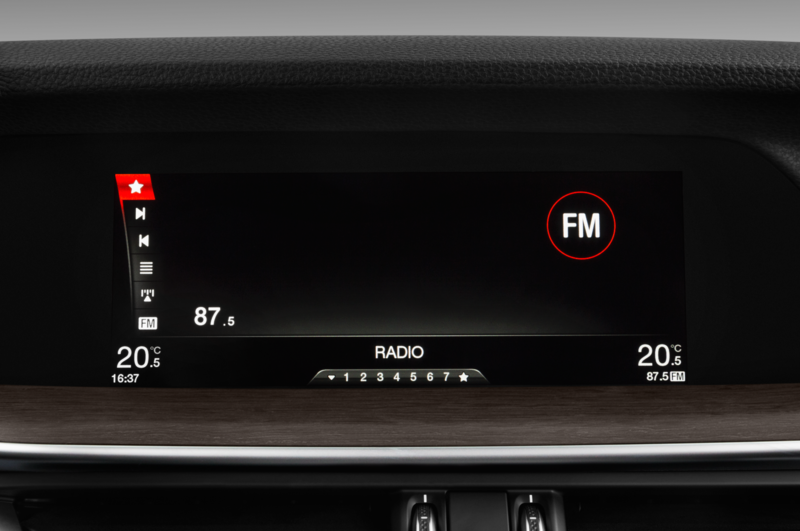 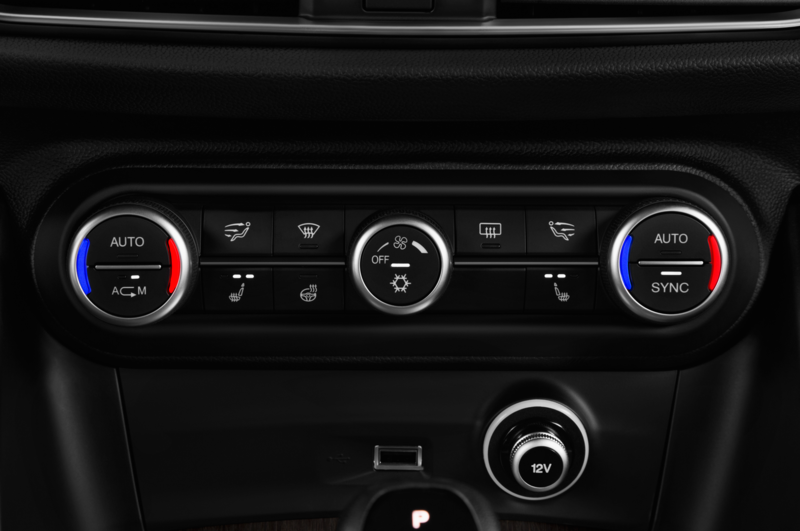 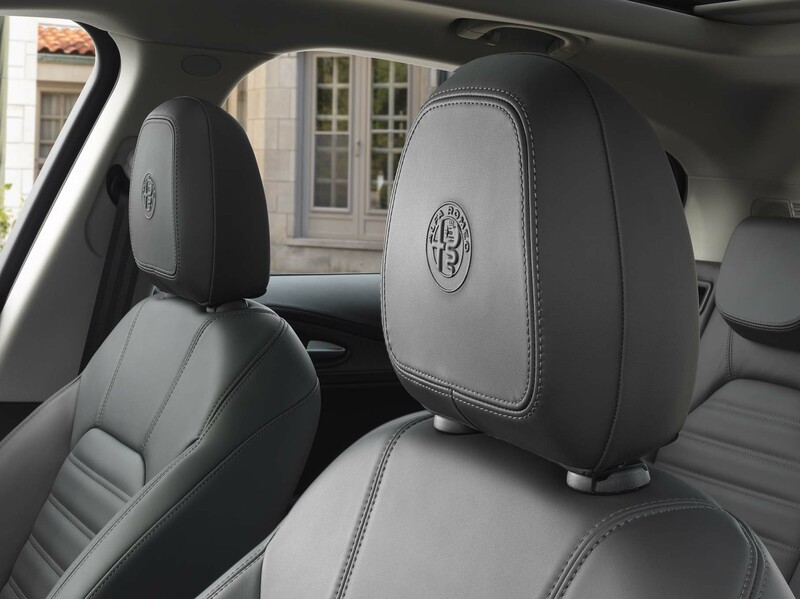 Also standard is a power tailgate, leather-trimmed upholstery, and wood and aluminum interior accents. 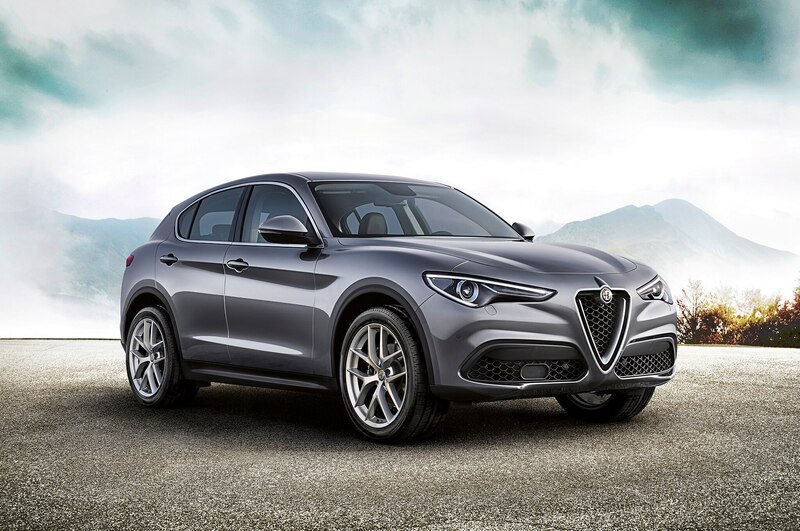 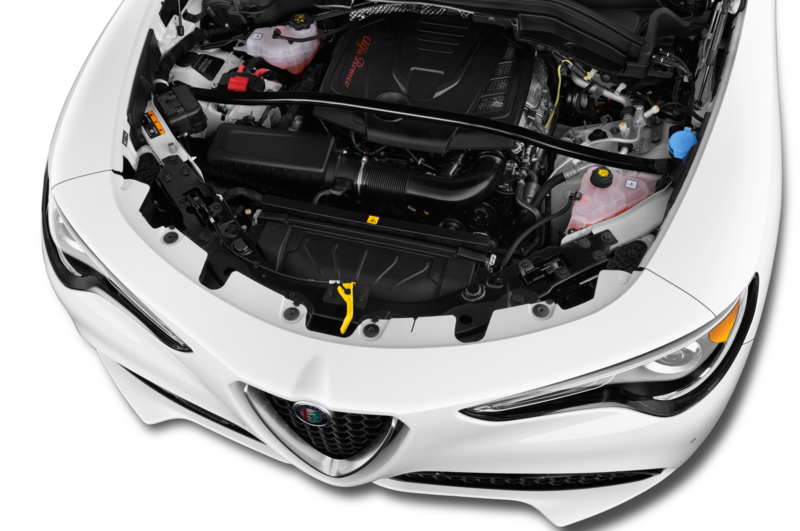 All Stelvios, base or not (other than the forthcoming Quadrifoglio), come with the 2.0-liter turbocharged, direct-injected four-cylinder, with 280 horsepower and 306 lb-ft of torque, mated to a ZF eight-speed automatic transmission. 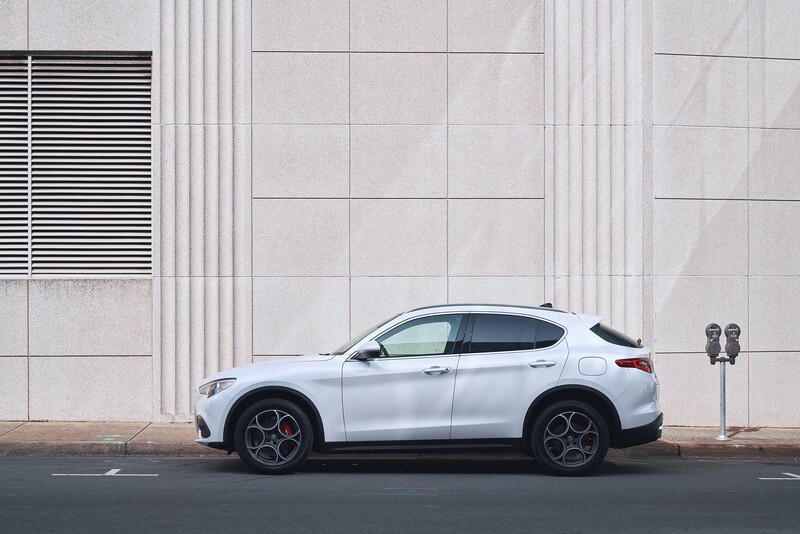 Despite lightening technology such as a standard carbon-fiber driveshaft, the Stelvio weighs in at 4,044 pounds. 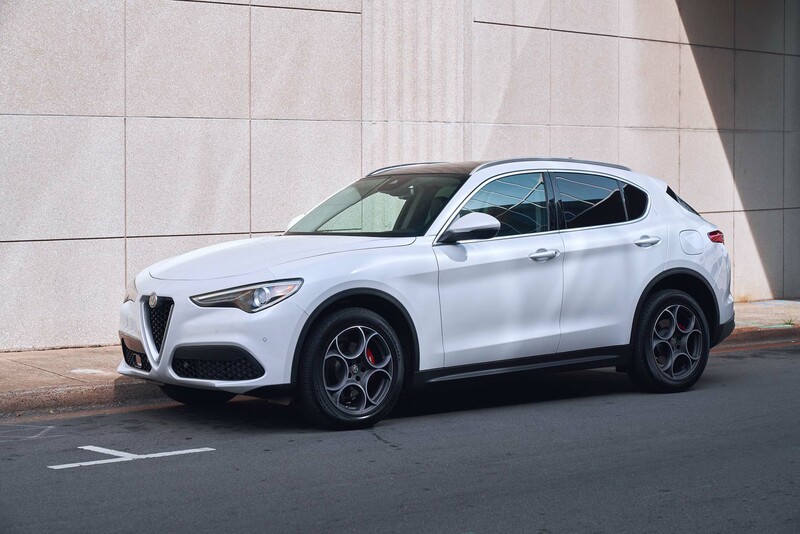 The little four-banger and the willing transmission do a more than passable job of moving the Stelvio along, but we suspect it would take a while to reach the claimed top speed of 144 mph. 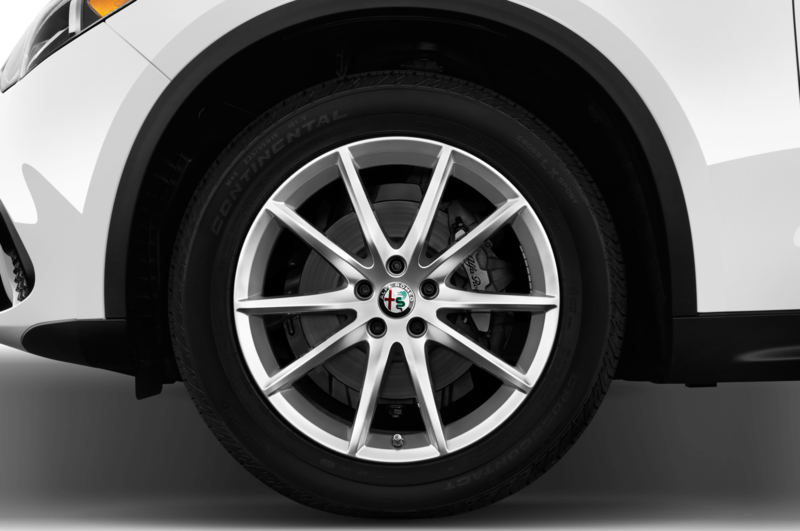 Brakes are four-piston Brembos up front, single-piston in the rear. 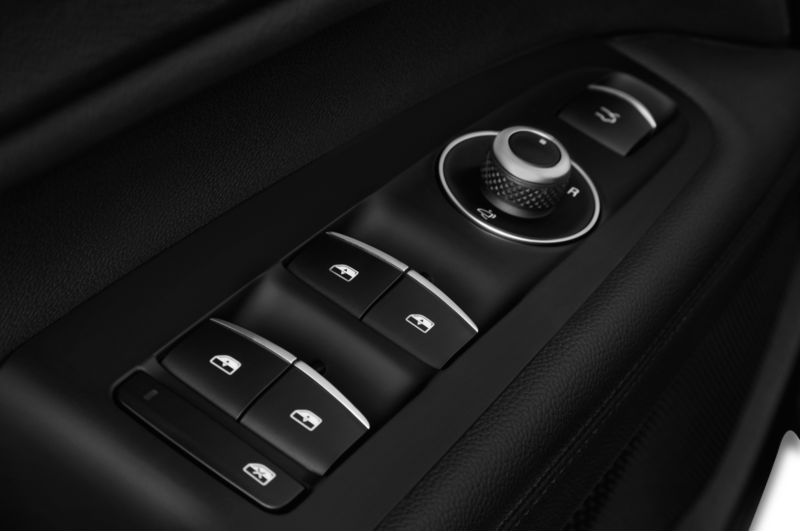 The feel is nicely modulated. 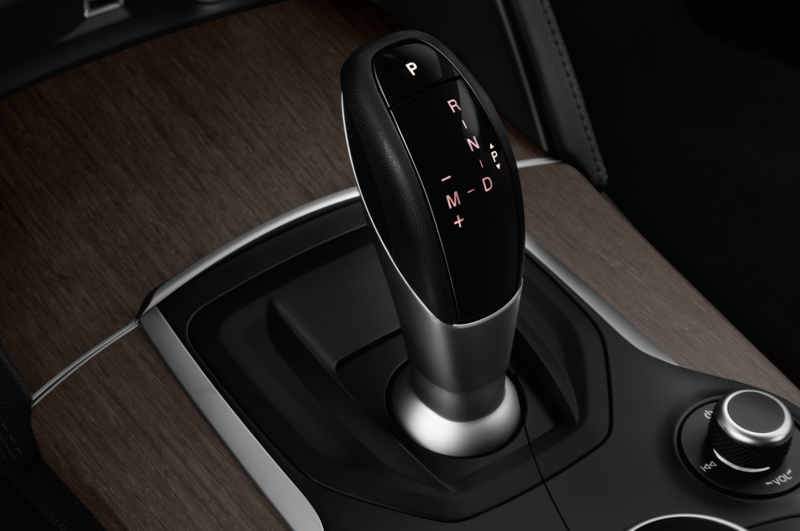 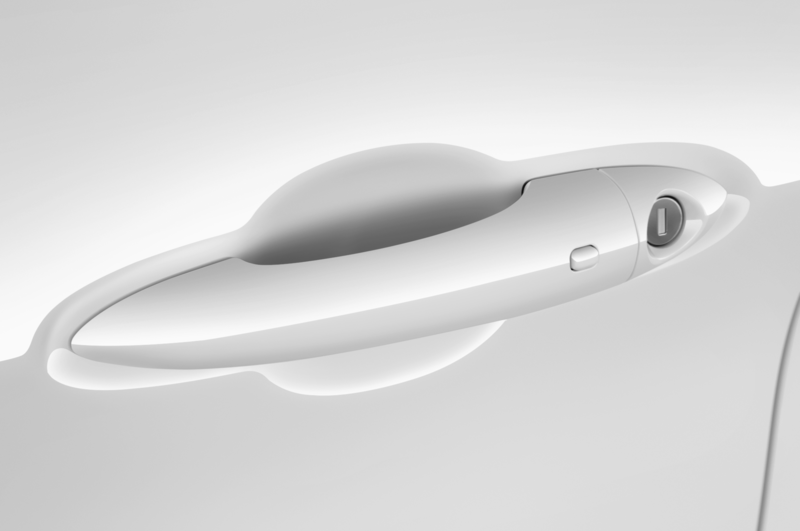 Same for the rack-and-pinion steering with variable electric assist; it’s suitably Italian, sensitive but never nervous. 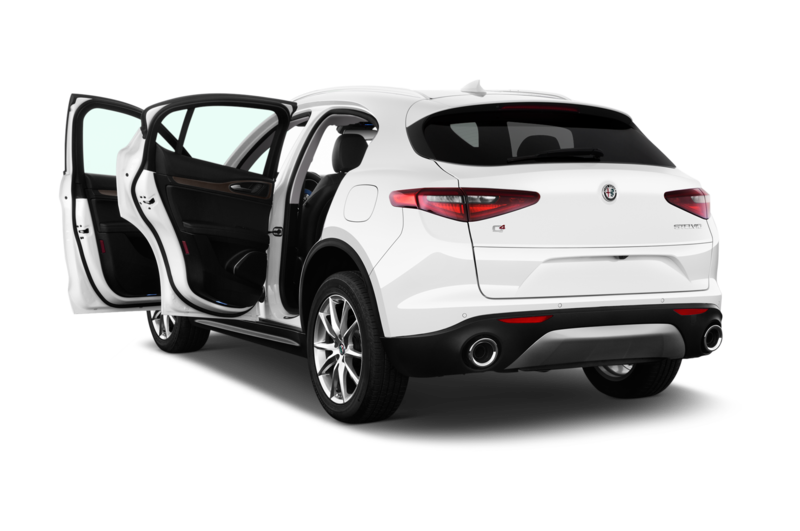 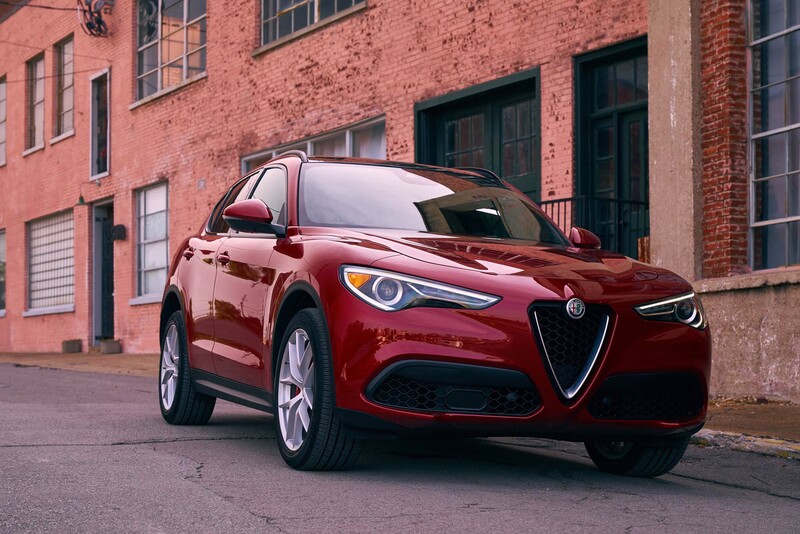 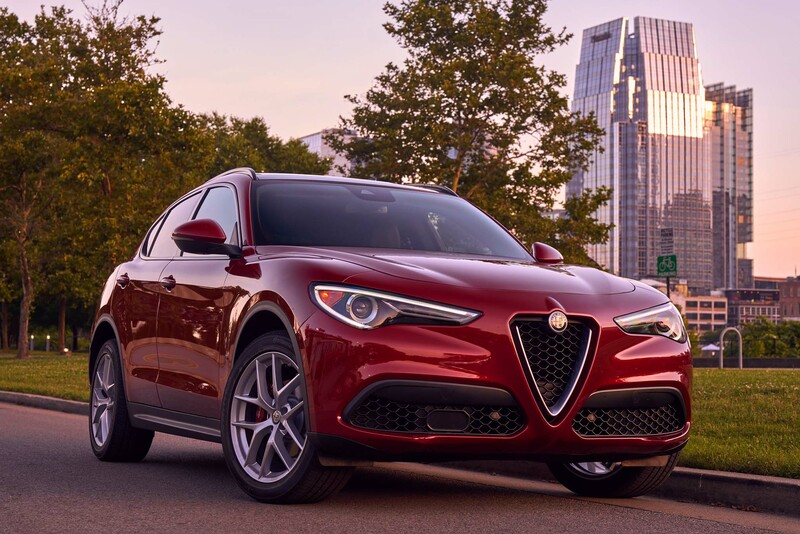 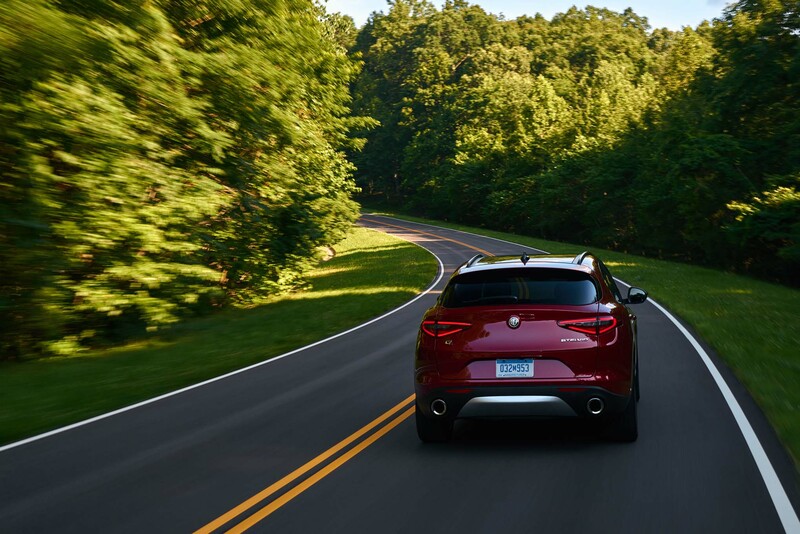 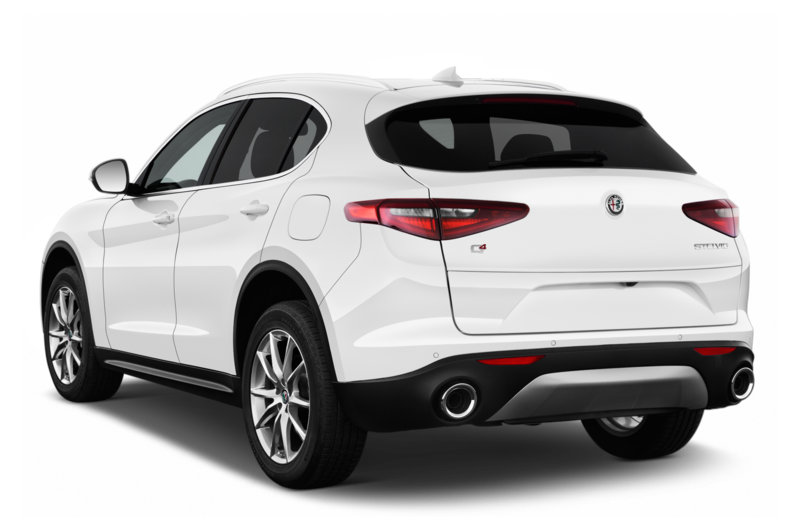 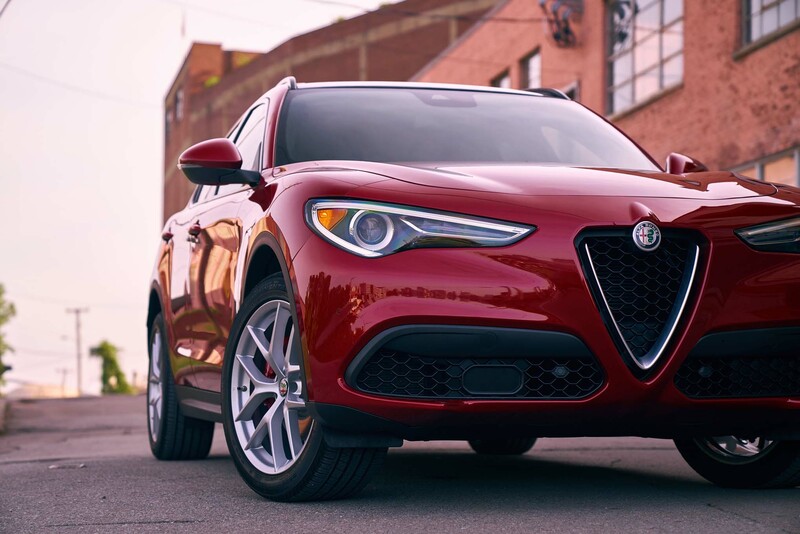 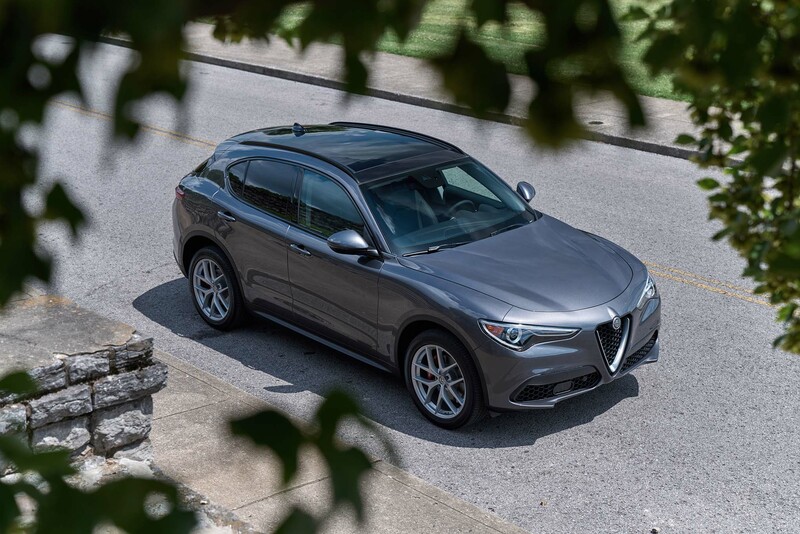 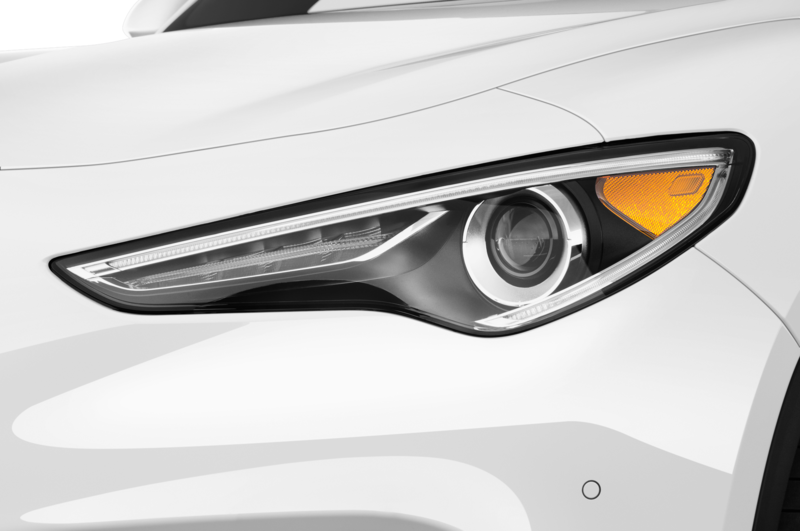 Add $1,800 and you can get a Stelvio Sport, which gets you 19-inch tires and wheels instead of 18-inchers; colored brake calipers, huge steering column-mounted paddle shifters, and a sport-tuned suspension. 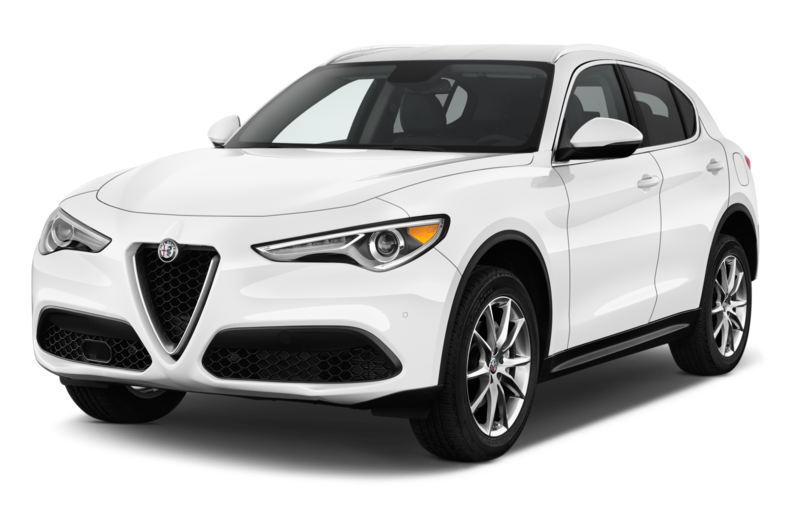 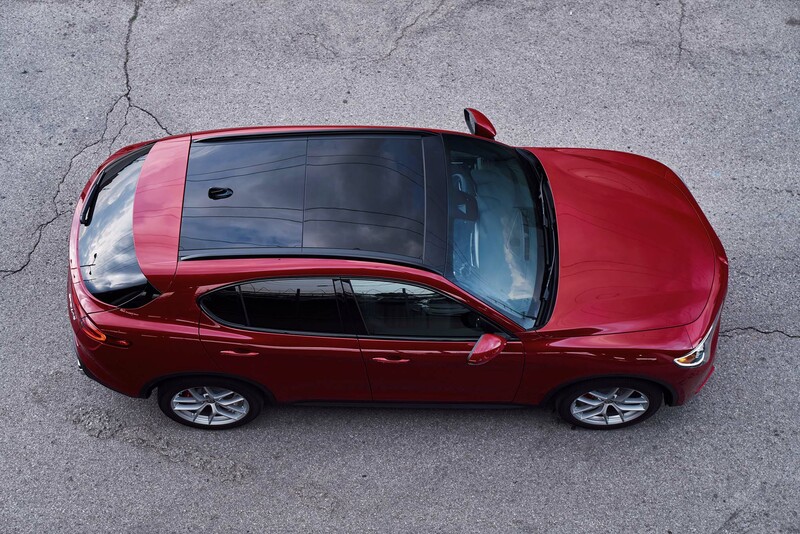 The Stelvio Ti, at $44,990, adds premium wheels, heated seats, front and rear parking sensors, and a few other features. 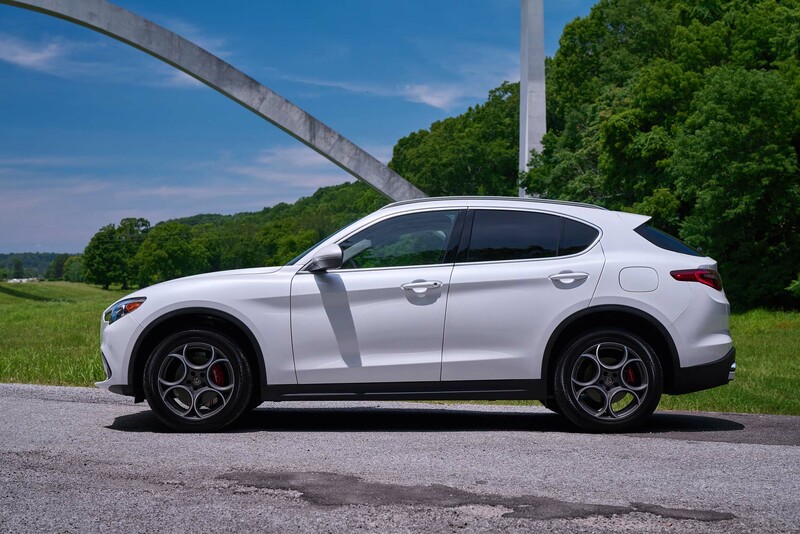 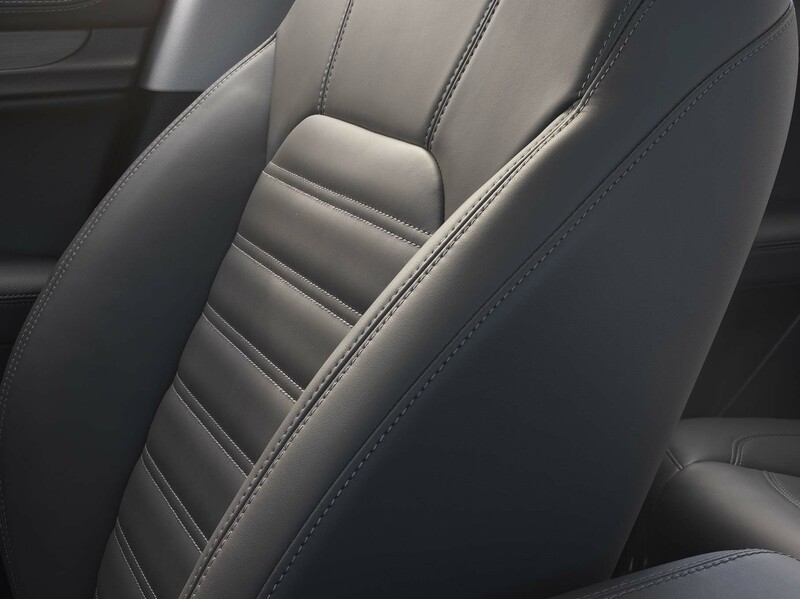 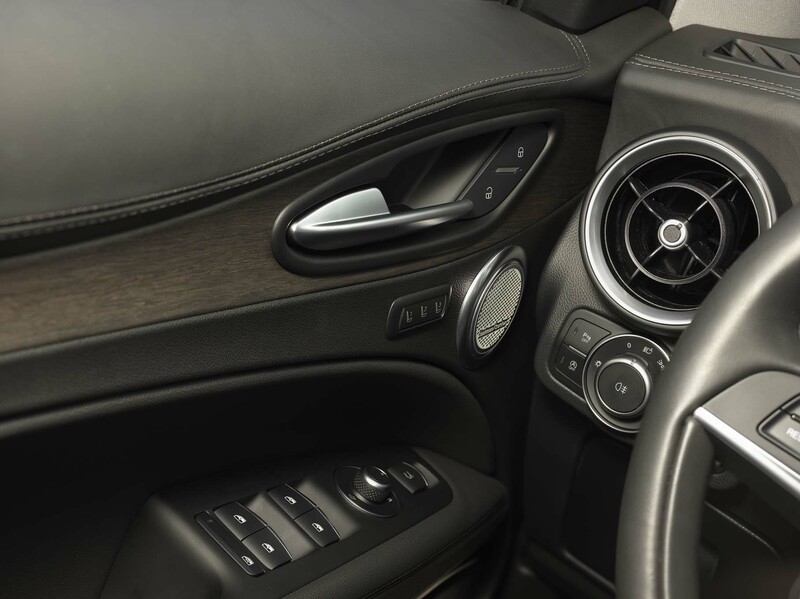 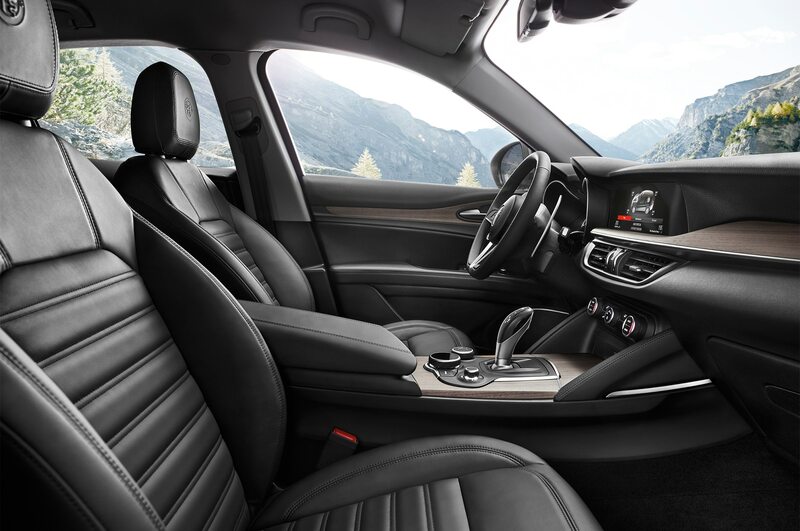 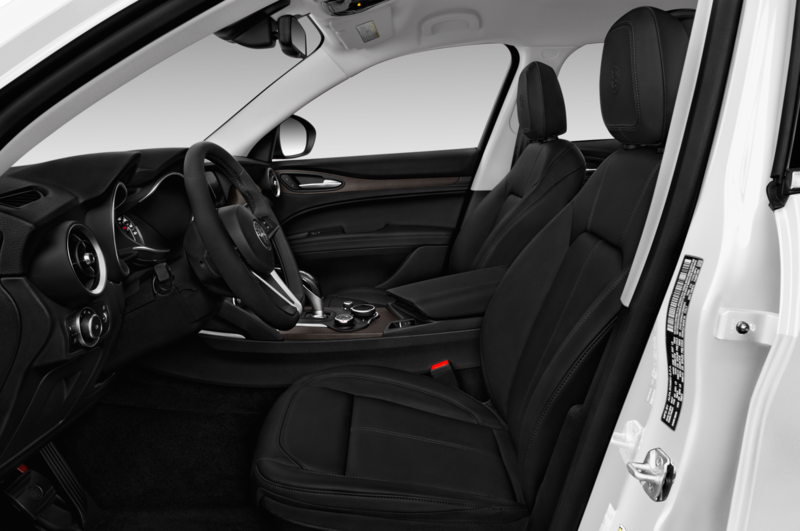 Then there’s the Stelvio Ti Lusso ($47,490), which gets you basically an upgraded interior. 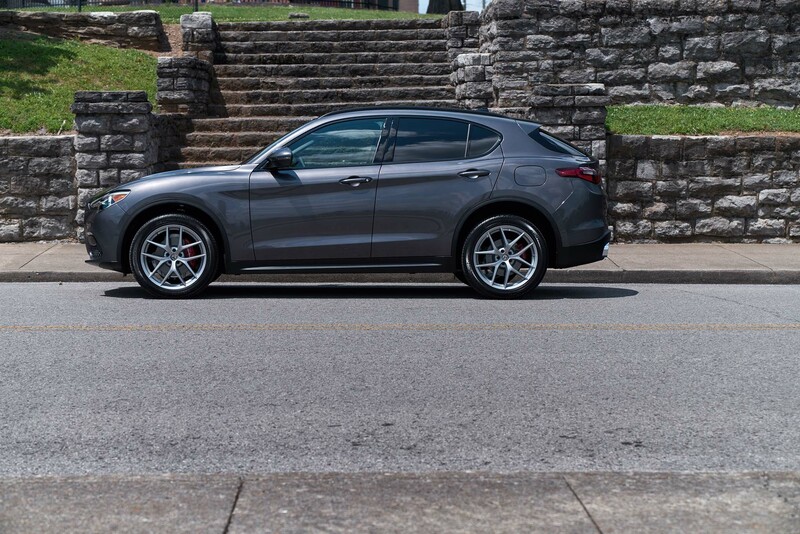 Then there’s our choice: The Stelvio TI Sport (also $47,490), adding 20-inch wheels and tires (capable, silent 225/45R20 Continental CrossContact LX Sports), colored calipers, premium leather sports seats (which still need more lateral support), and the aforementioned paddle shifters and sport-tuned suspension. 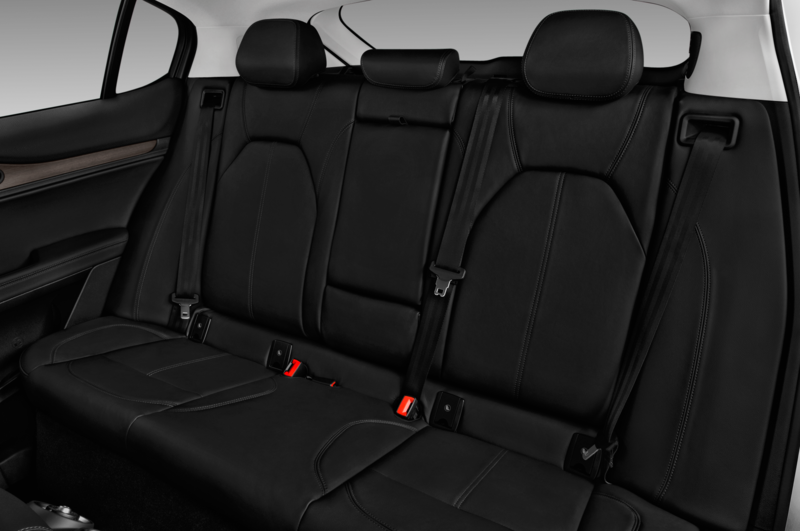 Rear seat room is adequate for two six-footers, but if I was the third six-footer in the middle, I’d be calling Uber. 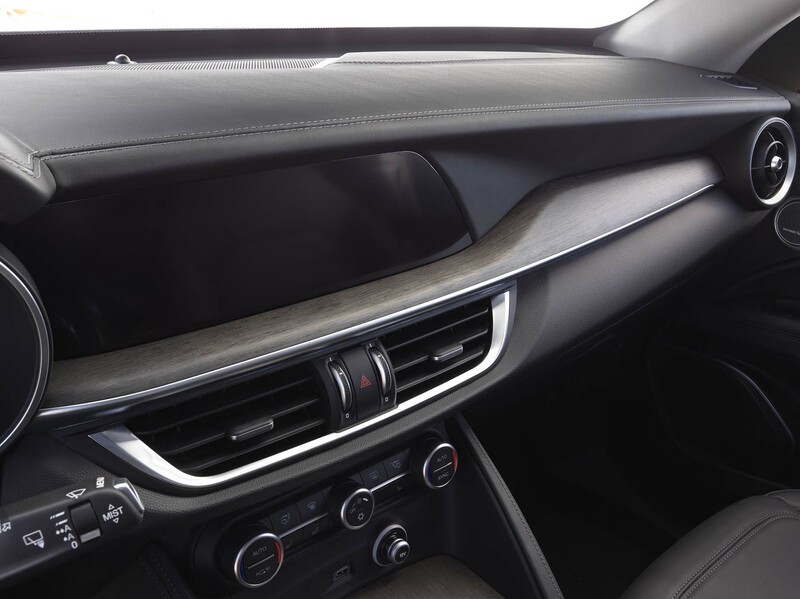 The front center console ends about six inches shy of the rear seat, so unless your feet don’t extend to the floor, you won’t be happy. 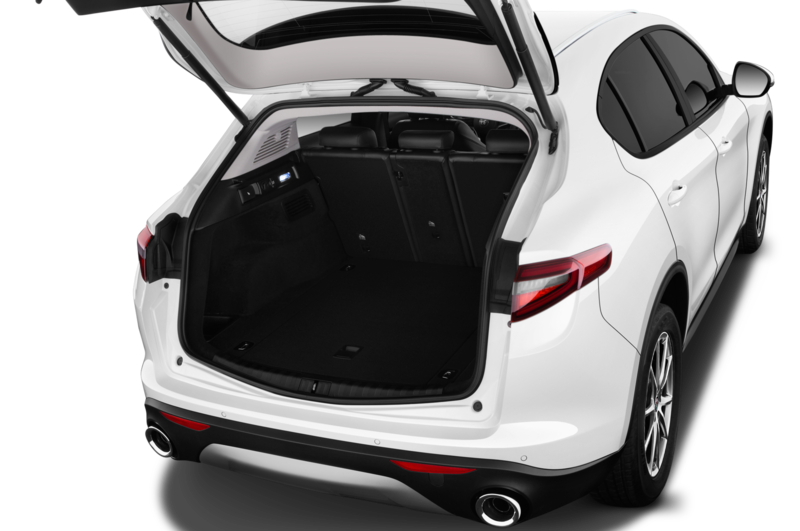 Luggage space is average at 18.5 cubic feet. 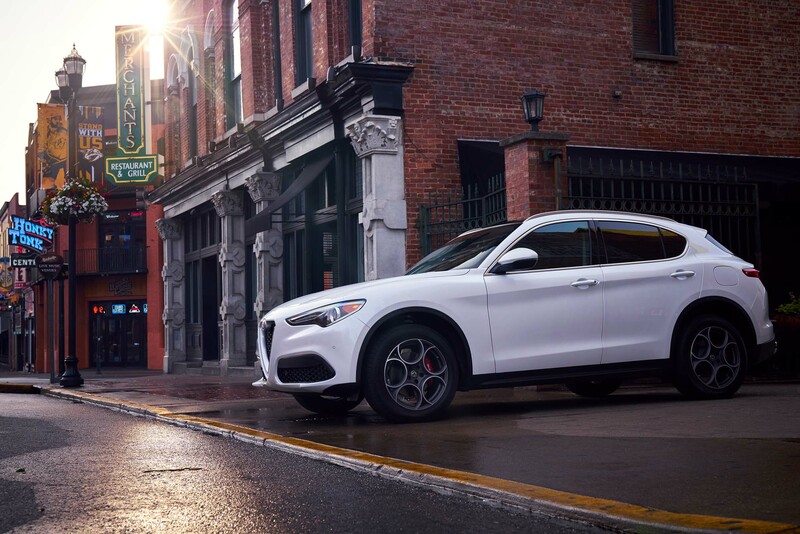 Alfa claims the Stelvio will tow 3,000 pounds, but we wouldn’t want to try that in the Italian Alps. 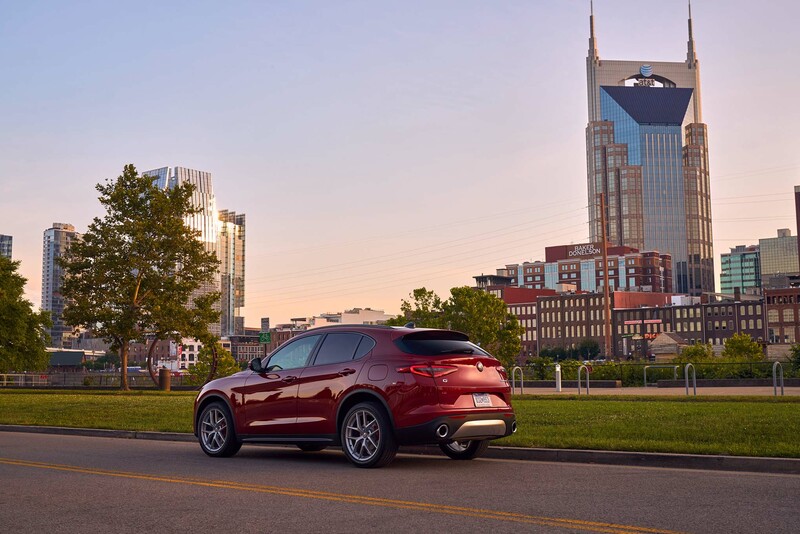 EPA-rated mileage is 22 mpg city, 28 highway, and 24 overall. 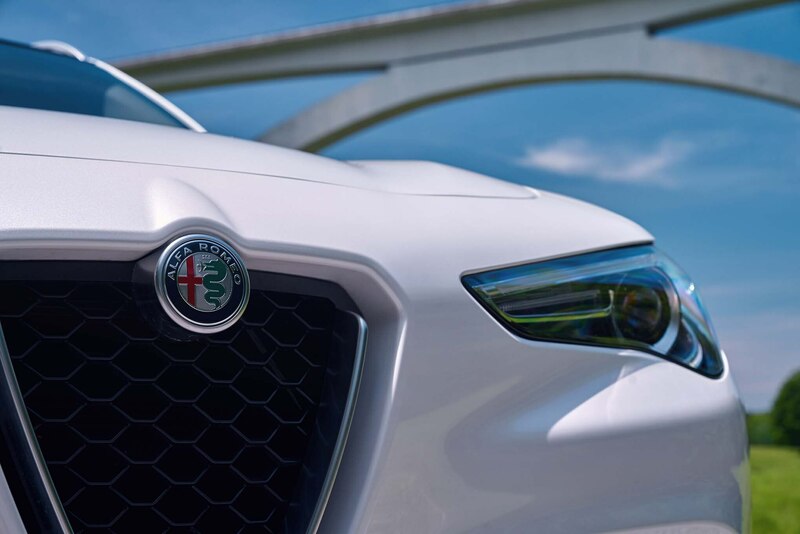 Premium fuel, please. 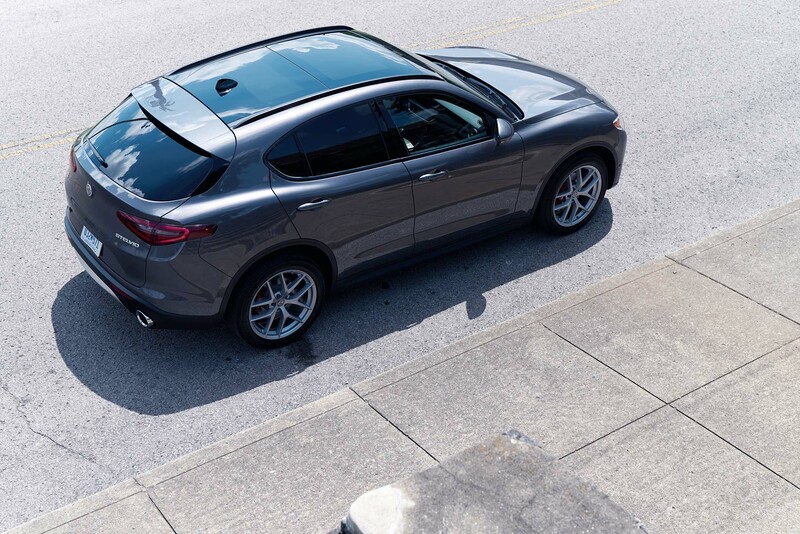 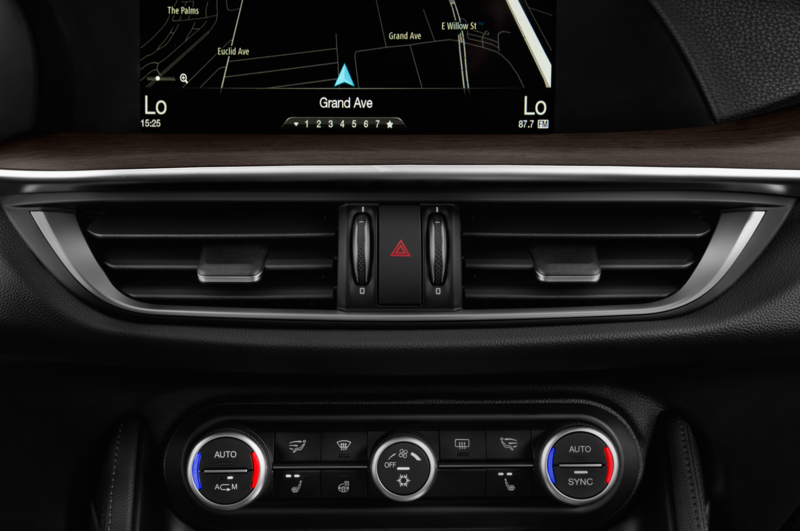 The Stelvio Ti Lusso we drove topped out at $54,490 with some nice options that included a dual-panel sunroof, upgraded wheels, a Harmon-Kardon sound system, and a couple of “driver assistance” packages and 3D navigation. 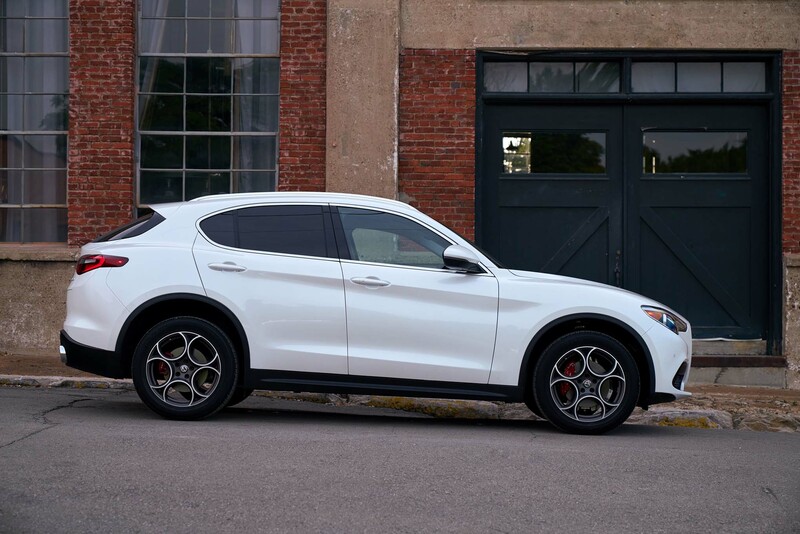 The Ti Sport listed for $54,090, and didn’t charge extra for the gloss-painted calipers. 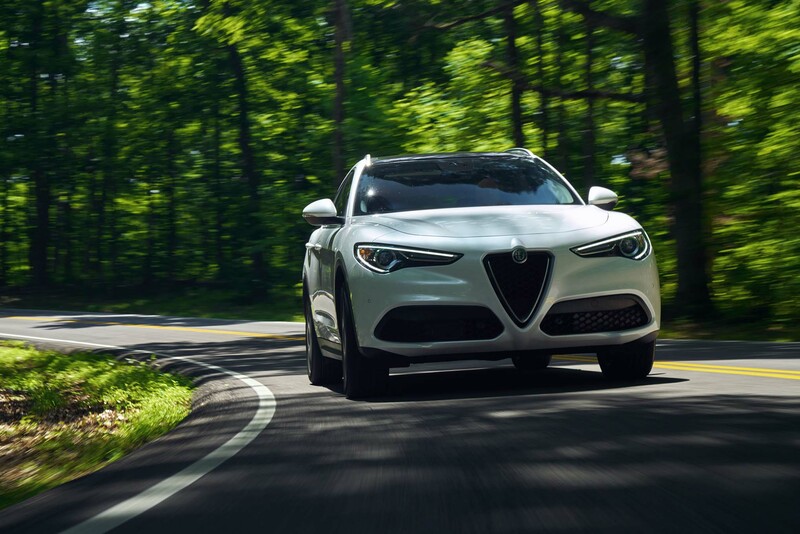 We came away liking the Stelvio a lot, but we like the Giulia a lot, too. 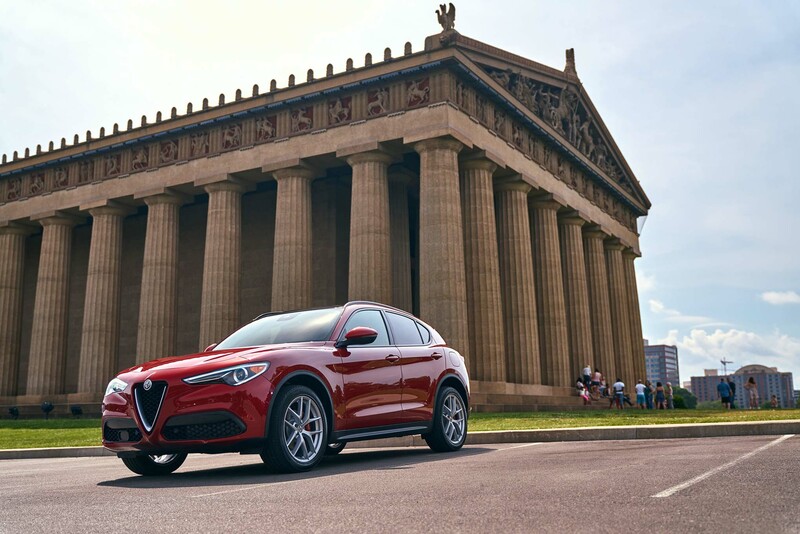 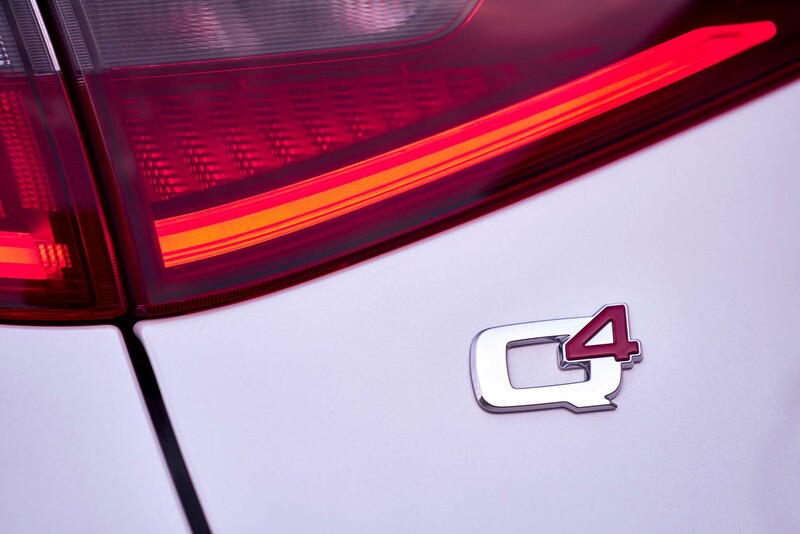 We’ve heard multiple reports of niggling problems, mostly electrical, with Giulias — and experienced some ourselves — most of which disappear, at least for a while, after simply turning off the ignition and starting it again. 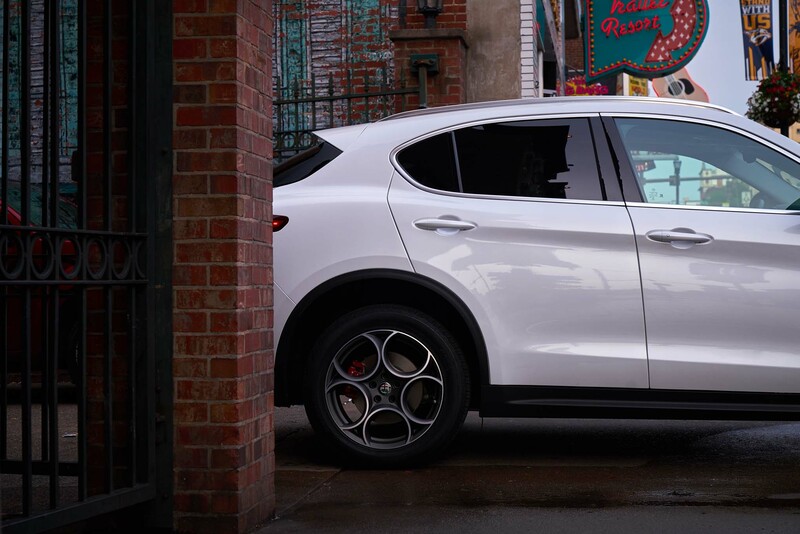 That happened with the Ti Lusso — a warning light that said the stop-start was inoperable and that we needed to check the throttle, but after a brief stop, all was working fine. 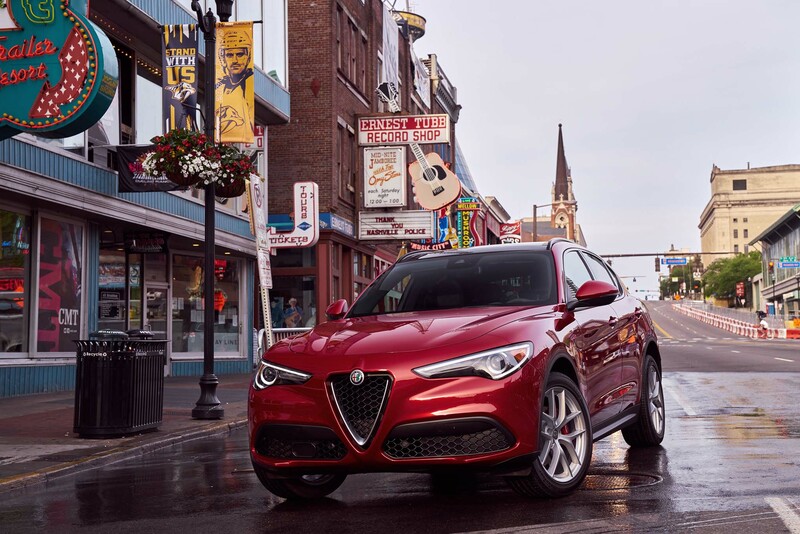 Alfa has the product; the prices are reasonable, and the Italian attraction is undeniable. 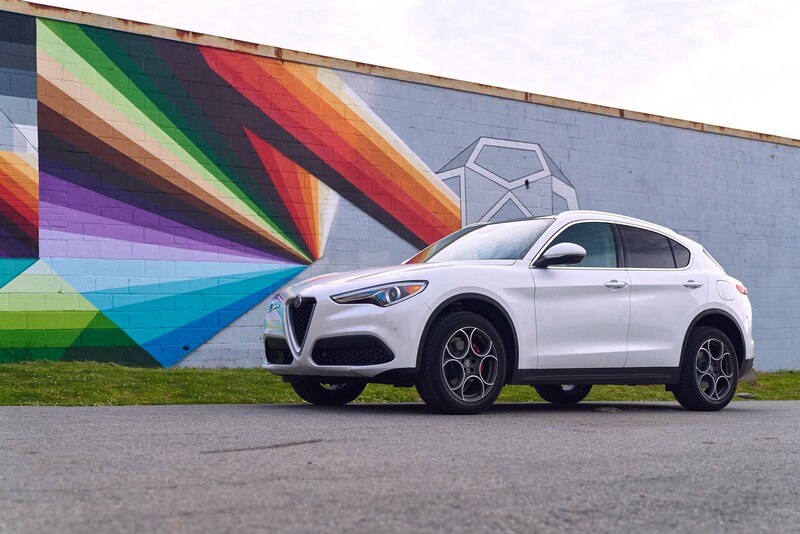 But the SUV crowd may not be as tolerant of these minor issues as, say, the Giulia Quadrifoglio customer is. 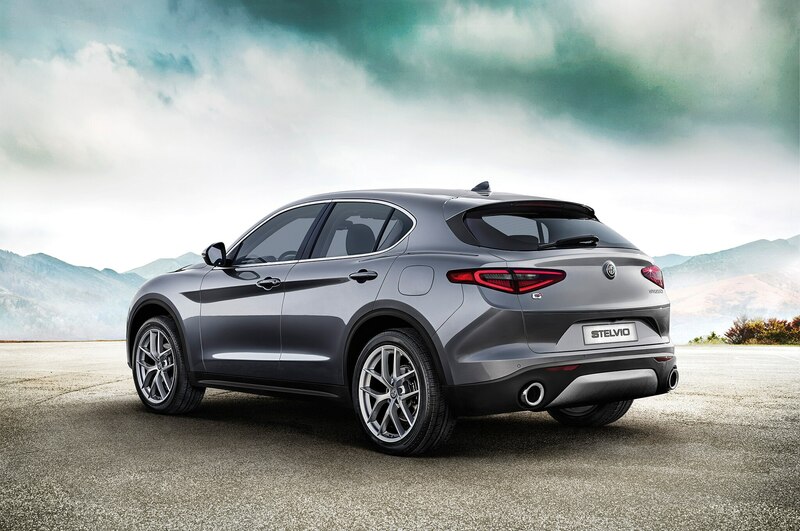 For Alfa to be a genuine contender in the premium SUV market, this is something it must address quickly.